Should I Believe in My Ideology? I am a liberal person and I support universal human rights and global ethics. In my opinion, what is considered wrong in my culture should be considered wrong in every culture. I think humans are pretty much the same everywhere and what feels bad here feels bad everywhere. Naturally, because of this, I also support individual liberties, like freedom of religion and freedom from religion. I am an ardent supporter of the freedom of speech. Refusing to discuss nearly always leads to conflict and hatred. Offending with words is much less harmful than offending with physical violence. Only with the help of an open discussion with certain rules of rational argumentation can we win without a fight. To implement this discussion we need democracy, an open society. Fundamentalists don’t want to discuss, because they have blind faith in their dogma. Dogmatism doesn’t accept any criticism and it hates democracy. Dogma is above discussion. That’s why dogmatism is dangerous. Dogmatism is inherently violent and virulently intolerant. Some would say that my support for universal human rights is colonialism, imperialism or cultural racism. They would perhaps argue that it is right and just to let people hold on to their cultural or religious traditions – their dogmas – even in the cases where they are clearly at odds with our Western humanistic values. The ideology of multiculturalism is a case in point. I am a secular humanist and scientific rationalist. I don’t believe in anything supernatural, be it gods, unicorns or fairies. I demand evidence. But I do believe in certain humanistic principles and some values are very important to me. I can’t deny any individual her or his belief in supernatural things or beings, so I am willing to tolerate it. People have a right, a need, to believe. Sad to say, to many secular individuals political ideology like nationalism, Marxism, capitalism or feminism often becomes a pseudo-religion that in their minds is above criticism. So, it becomes a dogma. Also multiculturalism can be a dogma and indeed many times this seems to be the case. Even mentioning the problems of multiculturalism usually leads to accusations of racism and “Islamophobia”. Dogma is impervious to criticism – hence the negative labels for those who refuse to believe in that dogma. Labelling, however, is just a way of ignoring the arguments. I believe in many values that are not scientifically falsifiable. In this respect, I certainly have a need to believe. But at the same time, I don’t believe in racism, war, oppression, cruelty and injustice. I of course see evidence of these scourges nearly everyday in the news of the world, so they are obviously real, but I don’t claim them to be good or right in the moral sense. But I can’t wish them away, so I have to fight them with all my might. This is why I joined the Green League and that’s why I write. Evil, nasty and wrong things must be fought against. They don’t disappear without a fight. Only in fairytales the good guys always win in the end. We may indeed ask ourselves: who are the good guys? More to the point, as I’ve said, I am a member of the Green League, a political party that, when I joined, I thought stood for nature conservancy and support of universal human rights. The Greens also support immigration, mostly from Africa and Muslim countries. Now here comes the problem: I’ve noticed that it is a taboo to criticise Islam among the Greens. It seems mandatory for a member of this political organisation to overlook the grave injustices done in the name of Islam, lest we hurt the feelings of moderate Muslims who we, by definition, should tolerate and support, since we want them to immigrate to Finland. This, of course, is a much larger problem, since it indeed seems to be the unwritten law of the land to remain silent in the face of human rights violations committed in the name of Islam. So it’s not just the Greens who are afraid to criticise Islamist practises that go against our sense of justice, but most of the other political parties as well. These people just don’t want to admit that along with being a religion, Islam is a political belief-system – an ideology. And as we can see and read from the news very often these days, in many cases it is a totalitarian ideology of the worst kind. So I’m not sure at all if this hushing atmosphere is good for the moderate Muslims and their human rights here, there or anywhere. Remaining silent when something morally wrong is done is equal to approving it. And silencing the voices of critics, either in the party’s weekly paper or within the party discussions, is not a sign of democracy, quite the contrary. It’s a sign of dogmatism. It is also de facto supporting of totalitarian versions of political Islam. In my opinion, the leaders and members of the Green League and other parties who bury their heads in the sand should think about their double standard, since multiculturalism doesn’t imply moral relativism. We can respect the traditions and religions of other people and yet we shouldn’t tolerate evil aspects in them. Tolerating them is in fact racism. Inherent in this pseudo-tolerant attitude is the thought-pattern according to which we, as individuals, are above individuals representing these cultural traditions and that they are somehow too unintelligent or sensitive to accept any kinds of criticism and to engage in open discussion and rational thinking. Now think about that! “Among the intelligentsia, colour feeling only occurs in the transposed form, that is, as a belief in the innate superiority of the coloured races (…) Even among those who do not feel strongly on the colour question, snobbery and imitation have a powerful influence. Almost any English intellectual would be scandalized by the claim that the white races are superior to the coloured, whereas the opposite claim would seem to him unexceptionable even if he disagreed with it” (p. 424). So, maybe, this “transferred nationalism” plays a part here. While the modern intellectual “elite” holds its own values pretty much universal and beyond reasonable doubt, inherent in its ideology of “tolerant” multiculturalism is the Western history of colonialism and especially the Nazi racial theories and atrocities (though in this context we should always remember the Grand Mufti of Jerusalem). It’s like we should somehow still pay for the sins of our European fathers by compensating these evil deeds by welcoming the immigrants of African and Mid-Eastern origin. But seemingly “universalism” only holds for the original Westerners themselves and other cultures can have a free ride as far as human rights are concerned. I would say there’s something very condescending, if not outright rotten, in this attitude; exotic and strange need not be superior and needless to say, if we treat people as individuals, not members of groups, this entails equality between individuals, not equality between groups. Indeed there are clear signs of the fact that some members of the “intelligentsia” and political elite are willing to relinquish equality between individuals and instead support quotas and other “positive discrimination” methods to “help” the members of “oppressed” groups. At the same time, we are lucky to have many valiant individuals who don’t need our condescending help and who refuse to remain silent. They just don’t accept the a priori role of the “other” who we should by definition “tolerate” inherent in multiculturalism. We have Ayaan Hirsi Ali and Irshad Manji, for instance. But guess what? We don’t hear their voices among the Greens. We never read their wise words in the Green League’s weekly paper. Instead, they are a problem: but why? Because they in fact show that cultural and moral relativism isn’t a valid position. Hirsi Ali and Manji are living examples of the Enlightenment and the power of reason and open discussion; they both support universal human rights; Hirsi Ali relinquished her faith, whereas Manji is a devout Muslim who just wants a radical reform in Islam. These brave individuals have more than enough guts to engage in rational, open discussion about the grave injustices committed in the name of Islam. And yet they are a problem among the “tolerant” Westerners. Even supporting their ideas is considered dubious. And yet , what they speak and write for is exactly the bedrock of Enlightenment itself and hence, multiculturalism: the universal human rights. What we have here is a clear example of hypocrisy of the worst kind. All Western intellectuals (well, so-called intellectuals), politicians and human rights activists who ignore Hirsi Ali and Manji should think about it for a minute. These individuals and many others like them who come from Muslim cultures and yet are not afraid to acknowledge the violations of human rights done in the name of Islam are the clearest possible evidence proving that multiculturalism and peaceful co-existence of different religions is possible. But it is only possible if we, instead of patronising and pseudo-tolerating the “others” with their exotic and sometimes brutal cultural traditions, treat them as equals and demand the same things from them that we demand from each other. We should not remain silent in the face of evil; we need to fight it all the time. We can be different, but not that different. You see; we share our humanity and humanness. We should not tolerate evil. And what is most important: we need to engage in open discussion, rational argumentation and let the voice of reason to be heard. So, should I believe in my ideology? Should I believe that people from different cultural backgrounds and religions could live peacefully together? Is there any reason for me to think that multiculturalism actually works? I think there is. But right now the gravest threat for multiculturalism comes from the ardent supporters of multiculturalism themselves, since as long as they refuse to acknowledge the full humanity – equality – of those who come from different cultural and religious background, multiculturalism only remains a dogma that we should blindly believe in. Now, in the West we are used to criticism of our own position and outlook. So why on earth shouldn’t we expect this from those who we welcome here to be an integral part of the West? Cultures change, people change. Look at the history of Europe! To conclude, I think I should believe in my ideology, but I want to emphasise that my faith is not and never will be blind. Equality doesn’t imply identity, but what it does imply is respect for human rights and open, rational discussion. Multiculturalism without critical discourse and listening to the voice of courageous dissidents is a travesty of my ideology. In fact, it is a crime against humanity. Länsimaissa eletään itsepetoksessa. Tämä asia on eittämättä jo tiedostettu niin sanottujen tavallisten kaduntallaajien keskuudessa ja samoin siellä, missä itsepetoksen tiedostamisesta katsotaan olevan poliittista etua. Tarkoitan ongelmaa nimeltä vanhoillinen islam. Maahanmuuton vastustajat ovat nykyisin lähes ainoa taho, joka uskaltaa nostaa sharia-lain vanhoillisen tulkinnan ja länsimaalaisen avoimen yhteiskunnan välisen ristiriidan keskusteluun. Tämä keskustelu käydään internetissä, erilaisilla blogeilla ja foorumeilla. Se ei aina ole kovinkaan asiallista. Päinvastoin. Älymystö ja poliitikot ovat kiusaantuneita ja kieltävät tosiasiat. Äärilaitojen näkemykset vaietaan kuoliaaksi. Ranskan ja Ruotsin nuorisomellakoita ei nähdä maahanmuutosta aiheutuvina ongelmina, puhumattakaan siitä, että ne nähtäisiin islamin aiheuttamina ongelmina. Mutta monikulttuurisuus, kuten mikä tahansa inhimillinen, erilaisia ja usein toisilleen vastakkaisia arvointressejä koskeva ilmiö, ei suju kuin tanssi. On pelkästään realistista todeta tämä asia. Olisi hyvä, jos se tiedostettaisiin myös älymystön ja poliitikkojen keskuudessa. Historiassa on esimerkkejä sekä siitä, että erilaiset uskontokunnat voivat elää rauhanomaista rinnakkaiseloa sekä siitä, että ne sotivat keskenään. Ihmiset taistelevat mielellään vallasta, niin rauhanomaisemmin kuin sotaisammin keinoin. Myös länsimaisessa pluralistisessa maailmassa löytyy tällä hetkellä esimerkkejä molemmista. Uskontojen ja uskonnollisten ihmisryhmien välisissä konflikteissa on eittämättä mukana useita tekijöitä, jotka eivät suoranaisesti liity uskontoon. Sosiaaliset tekijät kuten työttömyys, syrjäytyminen ja slummiutuminen ovat varmasti sellaisia, jotka ajavat nuoret miehet kaduille riehumaan ja tuhoamaan valtaväestön liikehuoneistoja ja omaisuutta. Mutta ne, jotka äänekkäimmin puhuvat maahanmuuton ja monikulttuurisen yhteiskunnan puolesta, kieltäytyvät itsepintaisesti näkemästä näitä ilmiöitä monikulttuurisuuden itsensä ongelmana. Sitä ne kuitenkin ovat. Kansainvälisessä katsannossa liberaali demokratia ja sekulaari humanismi ovat sellaisia arvoja, jotka parhaiten mahdollistavat yksilön oikeuksien ja yhteiskunnallisen tasa-arvon toteutumisen. Samoin länsimaisissa demokraattisissa yhteiskunnissa vähemmistöjen oikeudet on turvattu. Sen sijaan maissa, joissa vanhoillinen islamilainen sharia-laki on voimassa, mitään edellä mainituista oikeuksista ja arvoista ei tavata. Päinvastoin. Vanhoillisislamilaiset valtiot ovat totalitaristisia valtioita, joissa oikeus on vahvimman oikeutta. Se perustellaan uskonnon kirjaimellisella noudattamisella ja rangaistukset ovat epäinhimillisiä. Miten vanhoillisislamilaisten valtioiden surkea ihmisoikeustilanne suhteutuu länsimaihin ja miten asiaan reagoivat länsimaissa asuvat maltilliset muslimit? Kun vaikkapa Saudi-Arabiassa nuori nainen tuomitaan 200 raipaniskuun ja vankilaan siitä, että hänet on raiskattu, luulisi länsimaissa asuvien, liberaaliin ja tasa-arvoiseen oikeusvaltioon tottuneiden muslimien ryntäävän kaduille osoittamaan mieltään heidän omaa uskontoaan räikeästi väärinkäyttävien vanhoillisten mielivaltaista menettelyä kohtaan. Mitään tällaista emme ole havainneet. Samoin, kun brittiopettaja tuomitaan Sudanissa vankilaan siitä, että hän antaa oppilaidensa nimittää nallekarhua Muhammadiksi, odottaisi maltillisten muslimien sankoin joukoin nousevan länsimaissa välittömästi barrikadeille ja vaativan kotimaidensa hallitusten ja YK:n puuttumista asiaan. Mutta tässäkään tapauksessa maltilliset muslimit eivät nousseet puolustamaan ihmisoikeuksia ja rationaalisuutta. Vain reformimielinen ja rohkea Irshad Manji älähti. Vastaavasti hän älähti Torontossa sattuneesta ikävästä tapauksesta ja aihetta kieltämättä olikin. Esimerkkejä voisi esittää enemmänkin, mutta nämä kolme viimeisintä riittäkööt. Mutta mitä me sitten näemme, mellakoiden ja riehumisen ohella? Näemme useimmiten raivostuneita muslimeita osoittamassa mieltään länsimaista avointa demokratiaa vastaan. Sananvapaus on yksisuuntaista. Jos länsimaalaiset lehdet julkaisevat Muhammad-pilakuvia, kuten mm. Tanskassa ja Ruotsissa, uhataan piirtäjät tappaa ja heidän kotimaansa lähetystöjä vastaan hyökätään. Länsimaissa muslimimielenosoittajat avoimesti kannattavat itsemurhaiskuja ja vaativat islamin loukkaajia mestattavaksi. Missä ovat maltillisten muslimien vastamielenosoitukset? Turkissa oli Muhammad-pilakuvajupakan aikaan yksi, mutta Turkkia ei lasketa länsimaalaiseksi, sekulaariksi valtioksi – sehän on sekulaari muslimivaltio. Turkki ei myöskään ole EU:n jäsen. Länsimaissa maltilliset muslimit eivät halunneet puolustaa kotimaidensa lehdistön- ja sananvapautta. Sen sijaan he vaativat uskonnolleen erikoiskohtelua. Tämä on ongelma. Islamilaisista maista tulevaa maahanmuuttoa kannattavat ja sitä vastustavat tahot reagoivat ongelmaan eri tavalla. Vastustajat saavat maltillisten muslimien hiljaisuudesta yhden lisäsyyn suhtautua heihin kasvavalla epäluulolla. Kannattajat liittyvät muslimirintamaan ja vaikenevat. Tai pahimmassa tapauksessa he jopa nöyristelevät islamin suuntaan, syyttäen kotimaidensa vapaata lehdistöä muukalaisvihasta tai niin sanotusta islamofobiasta. Mutta esimerkiksi Jyllands-Postenissa julkaistujen Muhammad-pilakuvien tarkoitus oli nimenomaan testata länsimaista sananvapautta suhteessa islamiin. Tuloksen me tiedämme. Kuvia käytettiin islamilaisissa maissa vihanlietsontaan länttä kohtaan ja myös länsimaissa asuvat muslimit osoittivat tässä yhteydessä, että he eivät pidä lehdistön- ja sananvapautta tärkeämpinä kuin profeettaansa pyhyyttä. Tässä on selkeä ja tulevaisuuden kannalta keskeinen arvoristiriita, josta toivoisi keskusteltavan enemmänkin. Ayaan Hirsi Ali kirjoitti ongelmasta hiljattain The New York Timesissa. Hänen viestinsä maltillisille muslimeille oli selkeä: ”Kun ’maltillisen’ muslimin käsitys myötätunnosta ja omatunnosta törmää Allahin määräämiin sääntöihin, hänen pitäisi valita myötätunto. Mikäli näin ei tapahdu laajemmassa mittakaavassa, maltillinen islam tulee jäämään toiveajatteluksi.” Hirsi Ali siis problematisoi koko maltillisen islamin ja näkee asian pessimistisesti, joskin realistisesti. Asiaa ei auta länsimaisen kantaväestön, poliitikkojen, älymystön ja viranomaisten hiljaisuus tai suoranainen islamismin tukeminen. Brittein saarilla nähtiin tästä hiljattain melko hyytävä esimerkki. Channel Fourin esittämä dokumenttiohjelma ”Dispatches – Undercover Mosque”, joka paljastaa brittimoskeijoissa harjoitetun radikaalin länsimaiden ja niiden edustamien humanistis-liberaalien arvojen vastaisen toiminnan, joutui poliisitutkinnan kohteeksi. Asiaa valvova viranomainen tuli kaikeksi onneksi siihen tulokseen, että ohjelma ei syyllistynyt ”islamofobiaan”, kiihotukseen tai vastaavaan. Mutta jo se, että poliisi tällaiseen tutkintaan lähti, kertoo varsin karulla tavalla vaaroista, joita monikulttuurisuuden nimissä harjoitettu ”suvaitsevaisuuskilpailu” aiheuttaa; kuten tutkinnan kohteeksi joutunut televisiodokumentti osoittaa, kiihotusta ja fobiaa esiintyy lähinnä länsimaista avointa yhteiskuntaa kohtaan. Jos tästä vaietaan tai sen paljastamisesta joutuu epäilyksenalaiseksi, olemme vaarallisella tiellä. Sookhdeon mainitsema pitkä ja vaikea tie voi siis länsimaista itsestään johtuen muuttua entistä pitemmäksi, vaikeammaksi ja jopa vaaralliseksi. Kuka länsimaissa nykyään nähtävästä suvaitsevaisuuskilpailusta – kulttuuri- ja moraalirelativismista – hyötyy? Vastaus on selvä: sekä maahanmuuton vastustajat että islamistiradikaalit. Kenelle siitä on haittaa? Tietenkin maltillisille muslimeille, länsimaiden uskottavuudelle ja viime kädessä, mikä on kaikkein huolestuttavinta, sekulaarille humanismille ja kaikelle mitä se edustaa eli eurooppalaisen valistuksen perinnölle. Kun molempien äärilaitojen voima kasvaa ilman keskikentän tiivistä joukkuepuolustusta, keskikenttä tulee ennen pitkää murtumaan. Siinä vaiheessa rakentava dialogi on jo mahdotonta, koska äärilaidat eivät halua rauhanomaista rinnakkaiseloa vaan toistensa tuhoa. Suvaitsevaisuuskilpailussa voi voittajaksi selvitä myös suvaitsemattomuus ja tätä eivät suvaitsevaisuuskilpailun osanottajat vielä ole ymmärtäneet. Mikäli länsimainen avoin, moniarvoinen ja –kulttuurinen yhteiskunta halutaan säilyttää, on sekä älymystön ja poliitikkojen että maltillisten muslimien yhtenä rintamana tunnustettava islamin ongelmat ja puututtava niihin niin islamistivaltioissa kuin länsimaissa. Jos näin ei tapahdu, kavala maailma ei ole enää kaukana vaan tässä ja nyt. Hiljattainen Sudanissa nähty Muhammad-nalle-tragikomedia on jälleen uusi esimerkki siitä, että kiihkoislamilaiset arvot ja käsitykset eivät ole yhteen sovitettavissa länsimaisen avoimen yhteiskunnan kanssa. Helsingin vapaa-ajattelijoiden puheenjohtaja Juha Kukkonen käsitteli brittiopettaja Gillian Gibbonsin tapausta erinomaisessa kirjoituksessaan ja analysoi siihen liittyviä epäkohtia. Otan tässä hieman laajemman perspektiivin asiaan. Millaisen viestin Sudanin islamistihallinto ja kadulla Gibbonsille kuolemantuomiota vaatineet fanaattiset muslimit lähettävät länsimaiden asukkaille? Toivovatko he toimillaan esimerkiksi helpottavansa länsimaissa asuvien muslimimaahanmuuttajien asemaa? On selvää, että asiasta hyötyvät vain ja ainoastaan maahanmuuttoa vastustavat tahot; he saavat juuri tällaisista esimerkeistä lisää vettä muukalaisvihamieliseen myllyynsä – aiheesta. Islamistien herkkänahkaisuus uskontoaan kohtaan on mielestäni hyvin kaksinaismoralistista. Yhtäältä voimakkaasti paheksutaan länsimaiden vapautta – jopa länsimaista käsin – ja vaikkapa profeetta Muhammadista piirrettyjä pilakuvia ja toisaalta länsimaisiin ihmisiin suhtaudutaan korostetun vihamielisesti heti, jos he islamilaisissa maissa asuessaan poikkeavat vähänkään islamismin polulta. Suvaitsevaisuus on siis yksisuuntaista; meidän pitäisi kunnioittaa islamistien arvoja ja hyvinkin brutaaleja tapoja, mutta heidän puolestaan ei näköjään tarvitse vähääkään välittää meidän perinteistämme, kuten demokratiasta, tasa-arvosta, ihmisoikeuksista, oikeudenmukaisuudesta, rationaalisuudesta, moniarvoisuudesta, suvaitsevaisuudesta ja sananvapaudesta. Kun uuteen hallitusohjelmaan on kirjattu tarve lisätä maahanmuuttoa Suomeen, ja ylipäätään kun huomioidaan muslimimaista länsimaihin kohdistuva maahanmuutto, luulisi olevan selvää, että islamistien tulisi pääasiassa olla meille kiitollisia avoimuudestamme ja avuliaisuudestamme. Näin ei kuitenkaan näytä olevan – päinvastoin. Tästä pääsemme ongelman ytimeen. Nykyisin vallassa olevat poliitikot, yliopistoväki ja niin sanotut intellektuellit sekä ihmisoikeusaktivistit lähinnä puolustelevat islamia, selittäen sen olevan rakkauden ja suvaitsevaisuuden uskonto. Kuitenkin toistuvasti näemme uutisista jotain aivan muuta. Tämä on johtanut melko orwellilaiseen tilanteeseen: ihmisoikeusaktivistit ja poliitikot vaikenevat islamin nimissä tehdyistä räikeistä ihmisoikeusrikkomuksista, muutamaa rohkeaa muslimitaustaista intellektuellia ja länsimaista ateistia lukuun ottamatta. Heistä mainittakoon Ayaan Hirsi Ali, Irshad Manji, Deeyah, Nazanin Afshin-Jam, Afshin Ellian, Ehsan Jami, Sam Harris, Christopher Hitchens ja Richard Dawkins. Kun muslimien määrä Euroopassa ja Pohjois-Amerikassa jatkuvasti kasvaa, sekä maahanmuuton että muslimien länsimaisia korkeamman syntyvyyden siivittämänä, olisi ensiarvoisen tärkeää korostaa rauhanomaista rinnakkaiseloa. Näin ollen länsimaiset poliitikot, ns. intellektuellit sekä ihmisoikeusaktivistit ovat avainasemassa aidon suvaitsevaisuuden ja toiseuden kunnioittamisen edistämisessä. Sen sijaan he toimivat täysin päinvastaisella tavalla. He eivät uskalla ottaa kantaa islamin nimissä tehtyjä ihmisoikeusrikkomuksia vastaan, ilmeisesti siinä pelossa, että heidät leimattaisiin ”islamofobeiksi”, rasisteiksi tai äärioikeistolaisiksi. Vaietessaan näistä tapauksista ja näyttäessään siis muslimifundamentalismille käytännössä vihreää valoa, he itse asiassa pelaavat sekä äärioikeiston että islamilaisen radikalismin pussiin. Mihin tällainen kehitys pitkässä juoksussa johtaa? Vaihtoehtoja ei ole montakaan. Länsimaissa jo asuvien muslimien tulisi ennen kaikkea reagoida nopeasti ja sanoutua irti barbaaristen islamistihallitusten ja fundamentalistien toimista. Toistaiseksi merkkejä tästä ei juurikaan ole näkynyt. Tämä johtaa väistämättä kotoperäisten länsimaalaisten kasvavaan islamkriittisyyteen ja ääriliikkeiden suosion kasvamiseen. Islamistihallitusten ja fundamentalistien ajatuksissa eivät siis näytä olevan ne miljoonat länsimaissa asuvat tavalliset muslimit, jotka joutuvat sopeutumaan liberaaliin avoimeen länsimaiseen yhteiskuntaan. Onnistuneen kotoutumisen kannalta ensiarvoisen tärkeää olisi saada muslimimaahanmuuttajat ymmärtämään, että täällä me emme hyväksy sen kaltaisia toimia, mitä hiljattain Sudanissa nähtiin. Sama pätee tietenkin muihinkin vastaaviin islamin nimissä tehtyihin ihmisoikeusrikoksiin. Myös länsimaisten hallitusten ja median pitäisi jyrkästi tuomita islamilaisissa maissa nähdyt räikeät ihmisoikeusloukkaukset yhtenä rintamana. Tämä olisi selkeä signaali islamisteille kaikkialla. Kun vastakkain ovat taantumus ja edistys, ei länsimaisten valtioiden asukkaille liene epäselvää, kumpaa kannattaa lähteä ajamaan. Mutta mikä olisi paras taho kertomaan islamilaisten valtioiden hallinnoille, papistolle ja kansalaisille nämä asiat, jotta viesti menisi tehokkaimmin perille? Vastaus on yksiselitteinen: länsimaissa asuvat muslimit. Toistaiseksi vain rohkeudessaan ylivertainen Irshad Manji ja muutama muu - tosin entinen muslimi - on tähän leikkiin uskaltautunut, mutta oli miten oli, mikäli suoraselkäinen ja periksi antamaton vastarinta brutaalia islamismia vastaan ei nouse länsimaista, se ei nouse ollenkaan. Islamistivaltioiden hirmuhallinnot ja vanhoilliset islamoppineet pitävät kyllä kansan ikeen alla, sen olemme jo havainneet. Näissä maissa toisinajattelua ei suvaita, johtuen juuri islamin nykytulkinnasta. Kyseinen paimentolaisheimouskonto on äärimmäisen helppo tulkita patriarkaalisesti ja kaapata vallanhimoisten fanaatikkojen käsikassaraksi. Tästä johtuen länsimaiden – erityisesti länsimaissa asuvien muslimien – tulisi olla asiassa tiukkoja ja määrätietoisia. Nähdäkseni 2000-luvun tärkein maailmanrauhaa ja yhteiskuntien koheesiota koskeva kysymys on radikaali islam-reformi, jota pontevimmin ajaa Irshad Manjin Projekti Ijtihad -liike. Länsimaisten poliitikkojen, yliopistoväen ja niin sanottujen intellektuellien sekä ihmisoikeusaktivistien on siis viimeistään nyt herättävä orwellilaisesta päiväunestaan ja tajuttava, että heidän päiväunensa on itse asiassa painajainen. Herätäkseen siitä, heidän täytyy heittää poliittinen korrektius historian roskatynnyriin, nähdä radikaalin islam-reformin välttämättömyys ja liittyä täysin rinnoin Projekti Ijtihadiin. I think I have to elaborate on the case of Ayaan Hirsi Ali, since one individual messaged me in private on MySpace a little while ago and I found his remarks very odd indeed. He actually tried to make Christopher Hitchens and Ayaan Hirsi Ali look suspicious. Moreover, he denigrated one of my friends on MySpace who supported Hirsi Ali on his blog. 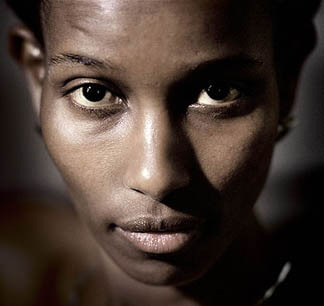 In my honest opinion, Ayaan Hirsi Ali is without a doubt the bravest woman on this earth and her treatment by the Dutch government is an outrage against humanity. Every single individual and state that is supposed to support the precious Enlightenment values like freedom of speech, civil rights, freedom of religion (including freedom to not to believe) etc., should of course protect people like Hirsi Ali with all their might. Without people like her, the world would be one miserable place indeed. I don't see what all this would have to do with Hitchens's opinion piece supporting Hirsi Ali and especially about his past beliefs and his views on the war in Iraq. I don't agree with Hitchens on every issue, but I find all this totally irrelevant to the issue at hand, that is, to the fact that Ayaan Hirsi Ali is hunted by some fundamentalist hitmen and needs 24-hour protection. Politically correct individuals and other Islam apologists can of course always beat around the bush about the picture some individuals paint of Islam, but the fact is that Irshad Manji, Ayaan Hirsi Ali, Salman Rushdie and Ibn Warraq (a pseudonym) are on the Muslim fundamentalists' hitlist. This is because they have criticised Islam (Salman Rushdie originally didn't even do that, he just wrote a satire and they wanted his head for that!). Who announced a Fatwa for Rushdie's head? Ayatollah Khomeini, a religious Shiite leader of the HIGHEST RANK, a specialist in Islamic law and practise appointed by other erudite Islam specialists. Who are moaning about the Scandinavian cartoons of prophet Mohammad? Yes, the Muslims of HIGHEST RANK, Ayatollahs, Imams and Mullahs, and even the top politicians of Muslim countries. The same goes with Sir Salman's later knighthood by the queen of England. So, from this fact we must conclude that there are certain forms of Islam that don't accept satire, free speech and criticism of its core tenets. These tenets of course come directly from the Koran and Hadiths. Moreover, from the current state of affairs we indeed must conclude that these forms of Islam are on the rise and in fact the status quo among the Islamic world at present. So, in my opinion, every individual who wants to be intellectually honest, must admit that the core of the problem in the case of Ayaan Hirsi Ali and other people like her is Islam itself. Islam doesn't seem to tolerate free speech and human rights. Quite the contrary. The first step in making the world a better place is facing the facts. There's no use in trying to change an IMAGINARY world, where Islam is a religion of peace and tolerance. Nothing changes if we tinker with a world that doesn't exist. So let's face it and make the Muslims understand that they must change their views - based on brutal Iron Age tribal superstitions - and adapt to the ways of the liberal, civil and humane Western world. In other words, they must revamp their religion radically, that is, secularise it. There's no other way out. And we, the Westerners, must help them in this. 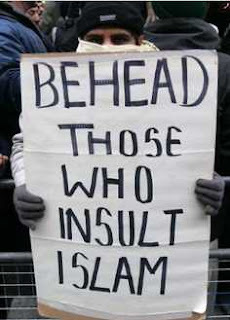 So let's face the facts and tell the Muslim world what we think about their brutal head-hunting. Irshad Manji. Photograph by Danielle St. Laurent 2007. 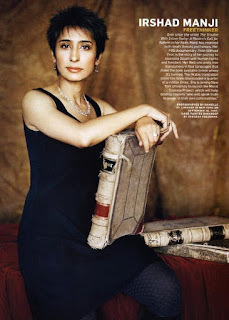 I've noticed in my home country Finland that many human rights activists and politicians consider Irshad Manji politically incorrect, since she doesn't beat around the bush about Islam's modern (read: iron age) interpretations and violation of human rights. So there is a major obstacle for Project Ijtihad to overcome: political correctness. This "invisible thought-police" is mainly due to the overkill of the respect for the "others" that in itself is a good thing. But there's a kind of sad irony in the fact that this respect for "them" is still called tolerance even when it entails a quite arbitrary collectivist frame of mind, labelling all "Muslims" as "Muslims". The nuances get lost in the competition to be the most tolerant person on earth. And then the whole thing turns into cultural and moral relativism. This, in turn, is de facto ignorance of human rights and on top of it, self-refuting. If there's no ethical standard for human behaviour, anything goes. Moral relativism is inherently contradictory, like any kind of relativism. More to the point, to argue that relativism is a valid position is impossible, since if it should be valid, it wouldn't be relativism. And now back to the case of Irshad. Even if a very outspoken and intelligent MUSLIM human rights activist like Irshad criticises evil deeds done in the name of Islam, she is much too often labelled as a "bad Muslim" by the politically correct Westerners. I find this infuriating and really can't understand how any reasonable individual could see Irshad as a "bad Muslim" or "not a real Muslim". But this very often is the case. So, the atmosphere of political correctness has in fact turned into something resembling fascism. It's a form of censorship, self-censorship to be precise. There seems to be thoughts that you simply aren't allowed to think. Criticising immoral deeds committed in the name of Islam is one of these taboos. And this is of course totally opposite to the spirit of ijtihad. To implement Ijtihad in the West big time, we need to get rid of political correctness and lax cultural relativism. At some point there's going to be a critical mass of us ijtihadists and then, only then, the "regular" human rights activists and politicians will join our ranks. So be this my plea to politicians, writers, journalists, TV & radio-show hosts and bloggers. Spread the word, don't beat around the bush. It's very easy to show that there's not just one Islam, but many versions of it, and the one that fits the 21st century like a glove is the one that Project Ijtihad pursues. Hollantilaisparlamentaarikko Ayaan Hirsi Alin pamfletti Neitsythäkki – Islam, nainen ja fundamentalismi (Otava 2005) on merkittävä teos monessakin mielessä. Ensinnäkin, koska kirjoittaja on ex-muslimi ja syntyperältään somali, saa hänen islamia kohtaan esittämänsä kritiikki poliittisesti korrektin länsimaisen ”älymystön” kiemurtelemaan. Tämä kaunis ja älykäs somalinainen on kylmästi omaksunut ”pahat”, länsimaiset arvot, eikä hän todellakaan puhu islamin kunnioittamisesta, kuten virallisen monikultturistisen suvaitsevaisuusliturgian mukaan tulisi tehdä. Hirsi Alin tekstistä on kulttuurirelativismi kaukana: hän puolustaa häikäilemättä valistuksen yleviä arvoja kuten rationalismia, tiedettä, vapautta, sisaruutta ja tasa-arvoa. Ja tietenkin sananvapautta. Kaiken huipuksi hän vielä uskaltaa esittää, että nämä arvot ovat yleismaailmallisia. Toiseksi, koska naisen alistettua asemaa islamissa kritisoivan Hirsi Alin viesti on niin feministinen, se on saanut muslimifundamentalistit raivon valtaan. Musliminaisten puolustaminen on johtanut mm. hollantilaisen elokuvaohjaaja Theo van Goghin kylmänviileään murhaan keskellä katua. Tämä siksi, että van Gogh erehtyi ohjaamaan Hirsi Alin käsikirjoittaman Submission Part 1 -lyhytelokuvan. Käsikirjoitus sisältyy Neitsythäkkiin. Elokuvassa läpinäkyvään kaapuun pukeutunut musliminainen esittää neljä puhetta, kohdistaen sanansa Allahille. Näissä provokatiivisissa tarinoissa kerrotaan karmivalla ja koskettavalla tavalla siitä, mihin kaikkeen nainen saa islamilaisessa kulttuurissa alistua. Kuvissa näytetään pahoinpideltyä naista ja toisen naisen paljaalle iholle kirjoitettuja Koraanin lauseita. Ayaan Hirsi Ali on käsikirjoituksensa tuomien tappouhkausten vuoksi joutunut piileskelemään ulkomailla ja vieläkin hän elää yhdessä henkivartijoidensa kanssa. Parlamenttiin hän on kuitenkin palannut. "Muhammedin oppi on ilmeisesti tämä: on sallittua viedä parhaan ystävänsä lapsi. 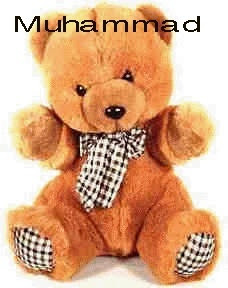 Meidän länsimaisten mittapuidemme mukaan Muhammed on perverssi mies. Tyranni. Hän vastustaa sananvapautta. Jos et tee kuten hän käskee, sinun käy huonosti. Se tuo mieleeni Lähi-idän suuruudenhullut vallanpitäjät: bin Ladenin, Khomeinin, Saddamin. Tuntuuko kummalliselta nähdä Saddam Hussein tässä seurassa? Muhammed on hänen esikuvansa. Muhammed on kaikkien muslimimiesten esikuva. Tuntuuko kummalliselta, että niin monet muslimimiehet ovat väkivaltaisia?" Hirsi Ali ei poistoon suostunut, mutta tästä huolimatta juuri tämä kohta jäi pois suomennoksesta. Asiaa seliteltiin jälkeenpäin ”teknisenä virheenä”. Uskoo ken haluaa. Tapaus sai jopa kansainvälistä huomiota. Poistettu kohta on nyt kuitenkin painettu erilliselle paperilapulle joka on sijoitettu kirjan väliin. Vastaavaa sensuuritaipumusta havaittiin myös Suomen poliittisen ja kirkollisen johdon sekä ns. älymystön ja elinkeinoelämän edustajien kohdalla taannoisessa Muhammed-pilakuvia koskeneessa farssissa. Asian tiimoilta taitelija Ville Rannan piirtämän satiirisen Muhammed-sarjakuvan julkaisseen Kaltio-lehden päätoimittaja Jussi Vilkuna erotettiin lehden hallituksen toimesta ja sarjakuva poistettiin lehden nettisivuilta. Tämä jos mikä osoitti tanskalaisen Jyllands-Posten-lehden alkuperäisen hypoteesin oikeaksi: islamismi rajoittaa kiistatta länsimaista sananvapautta. Juuri tästä syystä alkuperäiset pilakuvat on julkaistu Ayaan Hirsi Alille omistetulla nettiblogilla (http://www.ayaanhirsiali.web-log.nl). Hirsi Ali on myös antanut varauksettoman tukensa Tanskalle ja pääministeri Rasmussenille. Erityisenä ongelmana islamissa on tällä hetkellä se, että islamistinen fundamentalismi, politiikan ja uskonnon sekoittaminen, kasvattaa Yhdysvaltain ja sen liittolaisten töppäilyjen sekä muslimimaiden sisäisten ongelmien vuoksi koko ajan suosiotaan, niin islamilaisissa valtioissa kuin Euroopan muslimiyhteisöissäkin. Ääri-islamilainen hyväntekeväisyys- ja terrorijärjestö Hamas (arabiankielinen nimisana ’hamas’ vastaa termejä into, tuli, hehku, kiihko, polte, fanaattisuus) sai hiljan murskavoiton palestiinalaisalueiden parlamenttivaaleissa. Länsimaisen teknologian avulla TV-saarnaajien ja propagandistien taantumuksellista, jihadistista ilosanomaa on helppo levittää: Alankomaissakin lautasantennit on Hirsi Alin mukaan suunnattu siten, että islamistinen fundamentalismi saa yhä enemmän ja enemmän kannattajia. Jossain vaiheessa, kun maahanmuuttajia ja heidän jälkeläisiään on tarpeeksi, nämä vanhoilliset tahot saattavat pyrkiä järjestäytymään puolueeksi, ja silloin perinteiset eurooppalaiset arvot saavat islamismista taantumuksellisen haastajan. Silloin sananvapauden ohella on uhattuna moni muukin itsestäänselvyytenä pitämämme asia. Ayaan Hirsi Ali on tästä johtuen erittäin maahanmuuttokriittinen. Hän kannattaa maahanmuuttajien kotouttamista eli eurooppalaistamista. Islamin sekularisaatio on olennainen osa tätä prosessia. Mitä tulee yleissivistykseen ja kirjallisuuteen, arabimaissa yhteensä käännetään vuosittain viidesosa siitä mitä Kreikassa. 1980-luvun ensimmäisellä puoliskolla arabimaissa käännettiin miljoonaa ihmistä kohti 4.4 kirjaa, kun vastaava luku Espanjan kohdalla oli 920 ja Unkarin kohdalla 519 (The Arab Human Development Report 2003). Tieteellisen koulutuksen ja kirjallisuuden suhteen näkymät ovat tätäkin synkemmät. Lahjakkaat muslimitutkijat lähtevät länsimaihin, eikä aivovuodolle ole loppua näkyvissä. Tiedollisessa pimeydessä vaeltavat kansat ovat tietenkin oivallinen kasvualusta totalitarismille. Sananvapauden ja islamin ristiriitaa kuvastaa kouriintuntuvasti myös Hirsi Alin teoksen takakansitekstin selittely. Tällaisia selityksiä ei yleensä harrasteta muiden ideologien ja uskontojen kohdalla. Esim. Bertrand Russellin teoksen Why I Am Not a Christian takakannessa ei lue, että ”kirja ei esitä totuutta kristinuskosta”. Tai Heidi Liehun teoksen Perhosten valtakunta kannessa ei ilmoiteta lukijalle, että ”kirja ei esitä koko totuutta länsimaisesta valkoisesta heteromiehestä”. Kuin sinetiksi tämän päälle Hirsi Alin teoksen suomentajan nimi on jätetty mainitsematta – turvallisuussyistä. Samoin muualla. Tämä on kieltämättä outoa, jos kyseessä tosiaan on se rauhan ja suvaitsevaisuuden uskonto, mistä mm. professori Jaakko Hämeen-Anttila kirjoittaa ja puhuu. Kuin poliittisesti korrekteja selittelyjä ja saivarteluja ivaten Ayaan Hirsi Ali on sanonut, että sulkemalla silmät sen tosiasian edessä, että islam on naisten ohella vihamielinen myös homoja ja juutalaisia kohtaan, eurooppalaiset hallitukset ovat ostamassa menolippua takaisin keskiaikaan. Merkkejä tästä alkaa kieltämättä olla näkyvissä. On vaikea uskoa, että 2000-luvun Euroopassa ihminen voi joutua kuolemanvaaraan vapaa-ajattelun ja kriittisen asenteen vuoksi. Islamilaiset fundamentalistit ovat kuitenkin toistuvasti osoittaneet, että heidän uskontonsa on kritiikin yläpuolella, ja että islamin arvosteleminen on rangaistava kuolemalla. Koraanin totuus on heille ainoa totuus. Kirjailija Salman Rushdielle aikoinaan julistettu fatwa ei ollut ensimmäinen eikä viimeinen lajissaan. Myös Ayaan Hirsi Ali on haluttua riistaa. Ei ihme että Hirsi Ali otsikoi erään teoksensa avainkirjoituksista ”Älkää jättäkö meitä oman onnemme nojaan. Suokaa meille oma Voltaire”. Hirsi Alista itsestään on tulossa – tai on jo tullut – tämä Voltaire, toisinajattelija, uskonnollisen irrationalismin teräväsanainen kriitikko, joka haluaa tuoda valoa pimeyteen ja vapauttaa muslimit fundamentalismin ikeen alta. Käsittelen seuraavassa lähemmin mainittua kirjoitusta, koska se sopii oivallisesti Skeptikon aihepiiriin. ”De Winter kuvailee osuvasti islamin käytäntöä näytelmäksi, jossa ’sivuosia näyttelevät kokonaiset pyhimysten, henkien, enkelien ja pikkupirujen parvet. Konservatiivinen muslimi ei näin ollen sulje pois mahdollisuutta, että hänen vihollisillaan on yliluonnollisia voimia, joiden avulla he punovat juoniaan, ja tällaisille voimille ei keskivertomuslimista tietenkään ole vastusta’. Tässä yhteydessä de Winter siteeraa israelilaista professori Emmanuel Sivania, joka on tutkinut fundamentalismia: ’Maailma, jota kansoittavat henget, kuolleiden sielut, jinnit (näkymättömät olennot), joita on niin vahingollisia kuin ystävällisiäkin; maailma, jota ahdistaa viettelevä saatana demoneineen ja jossa uskovan avuksi voivat tulla pyhät miehet ja enkelit sekä tarpeen tulleen ihmeet; maailma, jossa yhteydenpito kuolleiden (varsinkin oman suvun jäsenten) kanssa on arkipäivää ja jossa yliluonnollisen läsnäoloa pidetään todellisena, lähes kouriintuntuvana” (Neitsythäkki, s. 31). ”Nämä luonnehdinnat ovat minulle muslimina täysin tunnistettavia. Kaikkialla maailmassa muslimeja kasvatetaan uskomaan tällaisiin yliluonnollisiin asioihin. Jokapäiväisessä muslimitodellisuudessa otetaankin tuonpuoleinen huomioon kaikessa. Tähän sopii myös käsitys, että marttyyrikuolema palkitaan paratiisissa. Olisi hyvinkin vaivan arvoista tutkia, missä määrin tämä terveen järjen puute islamin käytännössä mahdollistaa sen, että bin Ladenin ideologia vetää niin monia muslimeja puoleensa” (s. 31-32). Olisi myös mielenkiintoista tutkia, missä määrin kuvaus pätee Suomeen, jossa on yli 30 000 muslimia. Onko mainittu taikausko ja tiedevihamielisyys arkipäivää myös täällä? Entä miten on laita islamiin sisältyvän antisemitismin? ”Irrationaalista juutalaisvihaa ja vääräuskoisten inhoa opetetaan monissa koraanikouluissa ja toistetaan päivittäin moskeijoissa. Eikä siinä kaikki: kirjoissa ja artikkeleissa, äänikaseteilla ja tiedotusvälineissä juutalaiset esitetään jatkuvasti kaiken pahan alkuna ja juurena. Olen itse huomannut, miten pitkälle tämä doktriini voi vaikuttaa: nähdessäni ensimmäistä kertaa juutalaisen hämmästyin, kun hän osoittautui tavalliseksi lihaa ja verta olevaksi ihmiseksi” (s. 32). Muhammed-pilakuvista alkanut kohu ei tämän valossa yllätä: islam on Karan mielestä peruste rajoittaa länsimaista sananvapautta. Karan taiteilijoiden turvallisuutta koskeva heitto on erittäin huolestuttava. Karan kommentti ei periaatteessa eroa kristitystä keskivertokreationistista, paitsi ehkä hiuksenhienosti jälkimmäisen eduksi. Olenkin Ayaan Hirsi Alin kanssa täysin samaa mieltä siitä, että takapajuinen islam tarvitsee mitä pikimmin oman Voltairensa. Jos maailmankuvan rakentaminen lähtee sokeasta auktoriteettiuskosta, fanaattisuudesta ja kirjaimellisesta Koraanin tulkinnasta, ei siitä voi seurata mitään hyvää. Afganistanissa tästä saatiin muutama vuosi sitten jo esimakua, kun taliban-hallinto näytti epäilijöille missä kaappi seisoo ja palautti maan kivikaudelle. Tässä suhteessa Hirsi Alin keskiaikavertaus siis ontuu. On toki selvää, että Koraanin joihinkin kohtiin vetoamalla islamia voidaan puolustaa rauhan, rakkauden ja suvaitsevaisuuden uskontona. Samaan aikaan islamin nimissä voidaan kuitenkin lietsoa silmitöntä vihaa ja räjäytellä Buddha-patsaita, pilvenpiirtäjiä, junia, busseja, diskoja ja kilpailevan muslimilahkon moskeijoita. Profeetan sanan perusteella voidaan myös pakottaa naiset pukeutumaan burqaan ja teloittaa aviorikkojat – sekä tietenkin profeetan sanan epäilijät. Tämä on patriarkaalisille heimouskonnoille tyypillistä: ne ovat keino pönkittää valtaa, ja pyhien tekstien tulkinta riippuu tulkitsijan tarkoitusperistä. Kaikki ovat absoluuttisesti oikeassa, koska profeetan sana on laki. Ja jos 600-luvulla eläneen ylistetyn paimentolaisprofeetan sana sattuu olemaan sekava ja ristiriitainen, on viime kädessä turvauduttava kättä pidempään silloin kun epäilyä tai ylipääsemätöntä erimielisyyttä tulkintojen välillä esiintyy. Ja kuten olemme huomanneet, tätä tapahtuu usein. ”Islam ei ole käynyt läpi valistusprosessia, ja islamilaiset yhteiskunnat painiskelevat yhä samojen ongelmien kanssa kuin kristikunta ennen valistusta. Tutustuminen rationalismiin vapauttaisi yksittäisen muslimin mielen tuonpuoleisen ikeestä, jatkuvista syyllisyydentunteista ja fundamentalismin houkutuksesta. Oppisimme myös ottamaan vastuun jälkeenjääneisyydestämme ja ongelmistamme. Älkää siksi jättäkö meitä oman onnemme nojaan. Suokaa meille oma Voltaire” (Neitsythäkki, s. 36). Jo pelkän maailmanrauhan kannalta toive islamilaisten maiden yleissivistyksen tason nostamisesta ja sekularisoinnista on erittäin perusteltu. Onneksi Hirsi Ali tekee kaikkensa valistusprojektinsa eteen. Hirsi Alin terävä, nautittavasti kärjistävä proosa, säkenöivä äly ja uskomaton rohkeus eivät jätä mitään epäilyjen varaan: Hirsi Ali on eurooppalainen valistuksen perinnön edustaja, ihmisoikeuksien ja rationaalisen maailmankuvan horjumaton puolustaja, josta me kaikki ei-muslimit voimme olla ylpeitä. ”Minä haluaisin kirjoittaa filosofisia tekstejä, kuten esimerkiksi Karl Popper. Joten tämä askel, politiikkaan lähteminen, on vahingoksi ihanteelleni, paradoksaalista kylläkin. Mieluiten haluaisin ruveta filosofiksi ja kehittää omia teorioitani. Jokin tila kirjoittamista varten, joku joka siivoaisi puolestani, ei huolta jokapäiväisestä leivästä, oikeita keskusteluja tyhjän jutustelun sijaan. Silloin olisin lopultakin onnellinen” (s. 83). Toivottavasti Hirsi Alin toive toteutuu, sillä hänen ajattelunsa on postmodernissa, poliittisesti korrektissa nykymaailmassa harvinaiseen suoraselkäistä, selkeää ja johdonmukaista. Hänessä on siis ainesta merkittäväksi filosofiksi. Ja mikäli Hirsi Ali jatkaa Neitsythäkin veroisten teosten kirjoittamista, hänen taloudellinen riippumattomuutensakin on selviö. Jäljelle jää enää siivoojan ja tarpeeksi fiksun keskustelukumppanin löytäminen. Amerikkalaisen Sam Harrisin valtauskontoja ja perusteettoman uskon luonnetta terävästi arvostelevat kirjat Uskon loppu – Uskonto, terrori ja järjen tulevaisuus (suom. Kimmo Pietiläinen; Terra Cognita 2007) ja Letter to a Christian Nation (Alfred A. Knopf 2006) ovat lukijan kannalta siitä ongelmallisia, että lähes jokainen virke on alleviivaamisen arvoinen. Harrisin teksti on rationaaliselle ateistille silkkaa hunajaa, lievittävää voidetta vuosituhantisen järjettömyyden ja pimeyden kauhujen aiheuttamiin haavoihin. Nämä hulppeat teokset kuuluvat paraatipaikalle jokaisen itseään kunnioittavan vapaa-ajattelijan kirjahyllyyn. Suomentaja-kustantaja Kimmo Pietiläinen on tänä vuonna ansiokkaasti julkaissut peräjälkeen kolme erittäin tärkeää uskontokriittistä teosta. Nämä ovat ilmestymisjärjestyksessä Daniel C. Dennettin Lumous murtuu – Uskonto luonnonilmiönä, Richard Dawkinsin Jumalharha sekä em. Sam Harrisin alkukielellä elokuussa vuonna 2004 ilmestynyt esikoisteos. Letter to a Christian Nation on kirjoitettu vastaukseksi ja täydennykseksi aiemman teoksen herättämään kritiikkiin, mutta sitä ei ole ainakaan vielä käännetty suomeksi. Uudemmassa kirjassaan Harris oikeastaan tiivistää Uskon lopun sanoman. Tekijä ei säästele paukkuja uskonnollista järjettömyyttä roimiessaan. Erityisesti mieltä lämmittää se, että Harrisilla on runsain mitoin pokeria nostaa islamin kissa kunnolla pöydälle. Haluaisin totisesti nähdä professori Jaakko Hämeen-Anttilan – Suomen johtavan islam-hymistelijän - ilmeen, kun hän täysillä tykittävää Uskon loppua tai hieman tiiviimpää, mutta sitäkin räväkämpää Letter to a Christian Nationia lukee. Harris on Vapaa Ajattelijan lukijoille tuttu Jaakko Walleniuksen erinomaisesta artikkelista numerossa 1/2007 (s. 18-19). Pyrin tässä arviossani täydentämään Walleniuksen Harrisin ajattelusta antamaa kuvaa ja välttämään toistoa. Lyhyesti sanottuna kirjailijan viesti molemmissa teoksissaan on se, että uskonnollisia uskomuksia kohtaan perinteisesti osoitetun kohteliaan hiljaisuuden aika on ohi. Poliittinen korrektius ei saa estää meitä kutsumasta asioita niiden oikeilla nimillä. Uskonnollisiin dogmeihin alistuminen on yksinkertaisesti järjetöntä. Ja joukkotuhoaseiden aikakaudella myös äärimmäisen vaarallista. Samoin rautakaudelta periytyvään taikauskoon perustuvat käsitykset voivat estää niinkin lupaavan lääketieteellisen edistysaskeleen kuin kantasolututkimuksen käyttöönoton. Ja tämän päälle tulevat vielä jyrkät kiellot sekä rahoituksen vähentäminen koskien ehkäisyvälineiden käyttöä ja aborttia kehitysmaissa – nämä AIDSin ja liikakansoituksen riivaamalla vuosisadalla. Usko jumalan luomaan ihmissieluun istuu lujassa myös paavin näkymättömän sädekehän ympäröimässä harmaahapsisessa päässä. Sama pätee G.W. Bushiin ja hänen oikeamieliseen hallintoonsa. Uskonnollinen suhtautuminen asioihin estää ylimääräisen järjenkäytön karmivalla tavalla. Ihmishenkiä menetetään. Myös järkevän huumepolitiikan kannalta uskonnollisuus osoittaa välittömästi pahimmat puolensa; toisten yksityisasioihin – ”synteihin” – jatkuvasti puuttuva moralismi on johtanut kieltolakimentaliteettiin, jonka epäonnistumista mm. Yhdysvalloissa ei voi olla havaitsematta. Harris on huumeita koskevissa kannanotoissaan huomattavan liberaali eli poliittisesti niin epäkorrekti kuin olla voi. Samalla hän kuitenkin osoittaa, että Yhdysvaltain ”sota huumeita vastaan” on lähinnä osoitus kristillisen järjettömyyden täydellisestä umpikujasta. Se on sekä taloudellinen että moraalinen katastrofi. Teoksista käy ilmi myös se, että suurin osa sodista ja konflikteista johtuu uskonnoista; kun eri dogmit asetetaan vastakkain ilman toivoa niitä puoltavista todisteista, ei niiden ”paremmuutta” voi ratkaista kuin kättä pitempään tarttumalla. Itsemurhapommittajan käyttäytymistä on mahdoton selittää niin kauan kuin mukaan kuvioon otetaan Koraani ja hadíthit, profeetta Muhammadiin ja hänen aikalaisiinsa liittyvä islamilaisen perimätiedon kokoelma. Kun näiden vaikutus huomioidaan, voidaan ymmärtää Osama Bin Ladenin ja hänen käskyläistensä sekopäinen toiminta. Harris argumentoi vakuuttavasti, että taloudellis-poliittiset selitykset islamistiterrorismille eivät päde; Yhdysvallat on itse asiassa auttanut muslimimaita ja muslimeita paljon enemmän kuin häirinnyt ja nöyryyttänyt. Mutta tämäkin vain lisää länsimaita kohtaan tunnettua raivoa. Jos länsimaalaiset sitten yhtäkkiä kääntyisivät muslimeiksi, ei vihanpidolle enää olisi perusteita. Shiiat ja sunnit tietysti tappaisivat yhä toisiaan, mutta muilta osin maailmantilanne rauhoittuisi merkittävästi. Kaikeksi onneksi muslimilahkojen keskinäinen vihanpito ohjaa osan väkivaltaisesta energiasta pois maailmanvalloituksesta ja terrorismista, toteaa Harris kyynisesti Uskon lopussa. Lahkolaisten keskinäistä vihanpitoakaan ei tietenkään voi selittää muuten kuin uskonnollisen uskon irrationaalisella luonteella: eri lahkot vihaavat toisiaan, koska niiden jäsenet uskovat eri dogmeihin. Järjellä ei asian kanssa ole mitään tekemistä. Jo on aikakin, että joku huimapää sano tästä touhusta suorat sanat. Harris tekee sen mitä nautittavimmalla, mutta joskin myös herkempiä lukijoita järkyttävällä, tavalla. Neurotieteen tohtoriksi piakkoin valmistuva, täyslaidallisen toisensa perään ampuva uskontokriitikko ei suinkaan kiellä ihmisen taipumusta hengellisyyteen ja pyhiksi luokiteltaviin kokemuksiin. Päinvastoin. Tekijä on syvällisesti perehtynyt itämaiseen meditaatioperinteeseen ja tältä pohjalta hän luonnostelee empiiristä asennoitumista näihin hämäriin, mystisluontoisiin kokemuksiin. Harris suomii Uskon lopussa melkoisella ylenkatseella länsimaista filosofiaa; mm. vapaa tahto saa isän kädestä. Kirjailija ei myöskään kiellä paranormaalin ja vaikkapa reinkarnaation mahdollisuutta. Hän peräänkuuluttaa avointa suhtautumista näihinkin ilmiöihin. Tämän ohella tekijä puolustaa intuitiota, miettii onko kidutus joissakin tilanteissa moraalisesti hyväksyttävää ja kritisoi voimakkaasti pasifismia. Näihin kysymyksiin keskittyvät esikoisteoksen luvut ”Uskon luonne”, ”Hyvän ja pahan tiede” ja ”Kokeita tietoisuudella”. Harris esittää käsitystensä tueksi sekä neurotieteellistä tutkimusta että filosofista spekulaatiota (vaikka hän toisaalta kieltää spekuloivansa!) aivotoiminnan, uskomusten, tietoisuuden ja moraalin luonteesta. Kirjan loppuviitteisiin sijoitetuista tieteellisistä ja filosofisista artikkeleista sekä teoksista riittäisi luettavaa muutamaksi vuodeksi. Harris mitä ilmeisimmin tietää mistä puhuu. Tekijän viesti on harvinaisen selväjärkinen: kun hengellisten ja pyhien kokemusten neurologinen perusta ja niiden täsmällinen luonne on selvillä, ei niitä tarvitse enää selittää henkisesti köyhällä, primitiivisellä heimotaikauskolla. Moraalia koskeva eksakti luonnontiede on Harrisin mielestä mahdollinen – ja väistämätön. Tekijä esittää varsin ikäviä tilastoja molemmissa kirjoissaan: ”Useiden tuoreiden kyselytutkimusten mukaan 22 prosenttia amerikkalaista on varmoja, että Jeesus palaa maan päälle seuraavien 50 vuoden kuluessa. Toiset 22 prosenttia uskoo, että näin käy todennäköisesti” (Uskon loppu, s. 207-208). Harris kommentoi, että ”nämä ovat samat 44 prosenttia, jotka käyvät kirkossa kerran tai useammin viikossa, jotka uskovat kirjaimellisesti että Jumala lupasi Israelin maan juutalaisille ja jotka haluavat lopettaa evoluution biologisen faktan opettamisen lapsille” (ib.). Tämän ohella kirjailijaa huolestuttaa aiheellisesti se, että ”yli 50 prosentilla amerikkalaisista on ’negatiivinen’ tai ’erittäin negatiivinen’ käsitys ihmisistä, jotka eivät usko Jumalaan ja 70 prosenttia ajattelee, että on tärkeää että presidenttiehdokkaat ovat ’erittäin uskonnollisia’” (ib.). Samoin vain 28 % amerikkalaisista uskoo evoluutioon, mutta jopa 72% uskoo enkeleihin. Harris toteaa, että ”tällainen tietämättömyys keskittyneenä kömpelön suurvallan päähän ja vatsaan on nyt koko maailman ongelma” (ib.). Todettakoon vielä se, että 65 % amerikkalaisista on ”täysin varmoja, että Saatana on olemassa” (mt., s. 142) ja 74% kannattaa kuolemantuomiota (s. 144). Euroopankaan tilanne ei näytä hyvältä. Ranskassa on nykyisellä syntyvyydellä muslimienemmistö 25 vuoden kuluttua, vaikka maahanmuutto loppuisi huomenna (Letter to a Christian Nation, s. 83-84). Tuntien muslimien suhtautumisen naisiin, juutalaisiin, homoseksuaaleihin, vääräuskoisiin ja ateisteihin, ei kehitys todellakaan vaikuta kovinkaan ruusuiselta. Samoin muhamettilaiset harrastavat edelleen pakkoavioliittoja, kunniamurhia sekä rankaisevia joukkoraiskauksia (ib.). Länsi-Euroopan rikostilastotkaan eivät mairittele islaminuskoisia; Harrisin mukaan 70% Ranskan vankiloiden asukeista on muslimeja (Letter to a Christian Nation, s. 44). Siitä ei ole kauaa, kun Eurooppa oli vielä pimeyden vallassa. Kun kristinusko sai vapaasti mellastaa, paloivat noidat, oppineet ja kerettiläiset roviolla. Myöhemmin roihusivat juutalaiset natsien uuneissa ja tälläkin kauheudella on juurensa kristinuskossa. Harris osoittaa molemmissa kirjoissaan asioiden välisen yhteyden. Katolinen ja protestanttinen kirkko olivat osallisia natsien hirmutekoihin. Juutalaiset ovat historiallisesti olleet niin kristityille kuin muhamettilaisille vihollisia ja itse asiassa islamiin sisältyvä antisemitismi on paljosta velkaa kristinuskolle. Ateistin näkökulmasta kristityn on tietysti täysin järjetöntä syyttää juutalaisia Jeesuksen murhaamisesta, jos ja kun tämä kristinuskon mukaan oli jumalan tahto. Tällaisen itsestäänselvyyden tajuaminen on tietysti rautakautiseen heimotaikauskoon tukeutuvilta liikaa vaadittu. Nykyään juutalaisviha on sentään yleistä vain lähinnä islaminuskoisten keskuudessa – mm. äärijärjestö Hamasin perustamissopimuksessa mainitaan Siionin vanhempien päiväkirjat, joka on venäläinen väärennös ja juutalaisvastaisten salaliittoteorioiden vakiokauraa. Islamilaisessa maailmassa tällaisiin typeriin satuihin nojaaminen on edelleen arkipäivää. Eipä silti, etteivätkö juutalaiset itse osaisi olla Pekkaa pahempia: ”Juutalaisuus on luontojaan yhtä jakavaa, yhtä naurettavaa kirjaimellisuudessaan ja yhtä ristiriidassa nykyajan sivistävien vaikutusten kanssa kuin mikä tahansa muu uskonto. Käyttämällä ’uskonvapauttaan’ kiistanalaisella maalla juutalaiset siirtolaiset ovat nyt yksi tärkeimpiä esteitä rauhan tiellä Lähi-idässä. Heistä tulee suora islamin ja lännen välisen sodan syy, jos sellainen joskus syttyy Israelin ja Palestiinan konfliktista” (Uskon loppu, s. 86). Kun pohtii ihmiskunnan uskontojen ja niihin verrattavien totalitarististen uskomusjärjestelmien nimissä tekemiä hirveyksiä, voi ottaa avuksi Harrisin siteeraaman Will Durantin osuvan lohkaisun: ”Suvaitsemattomuus on vahvan uskon luonnollinen seuralainen; suvaitsevaisuus kasvaa vain, kun usko menettää varmuuden; varmuus on murhaavaa” (mt., s. 79). Onneksi Sam Harrisin viesti on kaikesta uskontoihin liittyvästä viheliäisyydestä huolimatta positiivinen; rationaalisuus, tiede ja länsimainen liberalismi voivat estää islamin ja lännen konfliktiin liittyvien apokalyptisten uhkakuvien toteutumisen. Tähän tarvittaisiin jonkinlainen maailmanhallitus ja ennen muuta ikävien tosiasioiden hyväksyminen. Uskonnollista uskoa pitää voida kritisoida siinä missä uskoa astrologiaan, ufoihin, tonttuihin ja menninkäisiin. Raamattu ja Koraani eivät ole erehtymättömän jumalan aikaansaannoksia, vaan taikauskoisten, tietämättömien, vallanhimoisten ja julmien paimentolaisten primitiivisiä sepitteitä. Loppukaneettina Harrisin loistaviin teoksiin en voi muuta kuin täydestä sydämestäni yhtyä Vapaa Ajattelijan edellisestä numerosta tutun amerikkalaisen ateistikaverini Larryn MySpace-blogillani taannoin esittämään luonnehdintaan: islam, judaismi ja kristinusko; hevonpaskan akselivallat. Ayaan Hirsi Alin helmikuussa englanniksi ilmestynyt omaelämäkerta Infidel (Free Press 2007) on erittäin ajankohtainen ja tärkeä teos. Tekijä kuvaa henkisen tiensä somalialaisesta islamistista ateistiksi erittäin koskettavalla tavalla. Infidel täydentää hienolla tavalla Hirsi Alin suomeksikin ilmestynyttä esseekokoelmaa Neitsythäkki (Otava 2005). Eräänä marraskuisena aamuna 2004 hollantilainen elokuvaohjaaja Theo van Gogh heräsi tavalliseen tapaan ja lähti polkupyörällä työpaikalleen amsterdamilaiseen elokuvayhtiöön. Matka katkesi yllättäen, kun muslimifundamentalisti Muhammed Bouyeri ampui van Goghia useita kertoja. Elokuvaohjaaja aneli: ”Voisimmeko jutella tästä?” Murhaaja ei välittänyt vaan ampui vielä neljä laukausta. Sen jälkeen hän otti esiin teurastajanveitsen ja sahasi van Goghin kurkun auki. Toisella veitsellä hän naulitsi viisisivuisen kirjeen elokuvaohjaajan rintaan. Kirje oli osoitettu Ayaan Hirsi Alille. Näin rajusti alkaa Hirsi Alin kertomus elämästään. Kaksi kuukautta ennen van Goghin murhaa he olivat tehneet lyhytelokuvan Submission Part 1, jonka Hirsi Ali oli käsikirjoittanut. Bouyerin kirje sisälsi tappouhkauksen. Elokuvassa Hirsi Ali ja van Gogh olivat kyseenalaistaneet islamiin sisältyvän naisen alistamisen. Tämä oli joillekin uskossaan autuaille islamisteille hieman liikaa. Todella mielenkiintoinen on pikku Ayaanin lapsuus. Tekijä esittelee länsimaisille lukijoille ikivanhoja somalialaisia tapoja, mm. verisukulaisuuteen perustuvan klaanijärjestelmän. Se, mihin klaaniin kuuluu, määrää ratkaisevalla tavalla avunantovelvollisuuden. Siksi lasten pitää pahan päivän varalta osata ulkoa sukuhistoriansa mahdollisimman pitkälle menneisyyteen. Hirsi Ali sai oppinsa ankaralta isoäidiltään. Vanhus opetti tekijälle ja hänen sisarelleen Haweyalle esimerkiksi sen, että ”yksinäinen nainen on kuin pala lampaanrasvaa auringossa. Kaikenlaista tulee ja syö tätä rasvaa. Ennen kuin huomaattekaan, muurahaiset ja hyönteiset ryömivät sen päällä, kunnes siitä ei ole jäljellä muuta kuin rasvainen tahra” (s. 9). Vanhakantaisessa somalialaisessa kulttuurissa naisen täytyy oppia huolehtimaan itsestään. Jos Allahin rukoileminen ei auta siinä vaiheessa, kun mies yrittää raiskata, täytyy turvautua isoäidin opettamaan liikkeeseen nimeltä Qworegoys. Todettakoon tässä vain se, että liike tekee taatusti raiskaajalle kipeää! Tällaiseen aavikon viisauteen sisältyy runsaasti rohkeutta ja perinnäistapoja, jotka nykyajan vuosikausia kestäneen sodan ja epäjärjestyksen runtelemassa somaliassa varmasti ovat vähitellen katoamassa. Hirsi Ali kertoo, miten diktaattori Siad Barrén kaapattua vallan vanha klaanijärjestelmä sukuineen hävitettiin väkisin ja väestö yhdistettiin somalian ”kansaksi”. Kirjailijan länsimaissa opiskellut isä vastusti Siad Barrén marxistidiktatuuria ja oli vankilassa Ayaanin ollessa pieni. Pikkutytöllä oli tapana kuvitella isänsä noina aikoina. Hirsi Alin isä onnistui kuitenkin pakenemaan vankilasta Saudi-Arabiaan, jonne muu perhe seurasi häntä myöhemmin. Tekijä havaitsi tuolloin, miten naisen asema tässä islamistisessa valtiossa on selvästi miestä alempi. Jo somaliassa tästä oli merkkejä, erityisesti julma tapa, jossa tytön sukuelimet silvotaan – oikeastaan leikataan kokonaan pois – ja jäljelle jäänyt haava ommellaan umpeen siten, että vain pieni aukko jää virtsaamista ja kuukautisverta varten. Kirjaan sisältyvät kuvaukset näistä kauheuksista eivät jätä mitään epäselväksi – kyseessä on mitä räikein ihmisoikeusrikos ja brutaali tapa, jota ei voi puolustella mitenkään. Samoin perinteiseen islamiin sisältyvä muiden uskontojen ja kansojen ylimielinen halveksiminen osoittaa, että sitä on todella vaikea sovittaa liberaaleihin eurooppalaisiin arvoihin ilman samankaltaista maallistumista, mikä kristinuskossa on tapahtunut. Vuonna 1980 perhe lensi maanpakoon Nairobiin, Keniaan. Ayaanin syvästi islaminuskoinen äiti ei tästä pitänyt, koska kenialaiset olivat hänen mielestään hädin tuskin ihmisiä, koska olivat epäuskoisia kuten etiopialaiset ja vieläpä erinäköisiä kuin somalit. Äiti suorastaan halveksi näitä ”epäihmisiä”. Hän käytti näistä mm. termiä abid, joka merkitsee orjaa. Ja vanhan isoäidin mielestä kenialaiset suorastaan löyhkäsivät. Saudi-Arabiassa perhettä oli kuitenkin kohdeltu samoin paikallisten toimesta, joten minkäänlaista humaania empatiaa ei kova kohtelu näille musliminaisille näytä opettaneen. Kristityssä Keniassa Ayaan pääsi joka tapauksessa länsimaiseen oppiin ja englanninkielen myötä hän kykeni syventymään koulunsa kirjaston antimiin. Tekijä kertoo muistavansa erityisesti Grimmin veljesten ja H.C. Andersen sadut, sekä hieman myöhemmältä ajalta mm. Enid Blytonin Viisikko- ja Salaisuus-kirjat. Viimeksi mainituissa teoksissa tytöt ja pojat olivat vapaita ja tasa-arvoisia, ja niissä esiintyi luottamusta sekä ystävyyttä, mikä hieman hämmensi isoäidin karmiviin, vaaraa ja epäilystä tulviviin klaanitarinoihin tottunutta Ayaania. Länsimaisen vapaa-ajattelun siemenet tulivat kuitenkin väistämättä kylvetyksi hedelmälliseen maaperään. Naisilla oli mahdollisuus valita. Kuukautistensa alettua ja erinäisen tyttömäisen kujeilun vuoksi Ayaan ja Haweya-sisar lopettivat äitinsä määräämänä siihen asti käymänsä koraanikoulun. Tilalle äiti palkkasi kiertävän, ankaran ja vanhakantaisen opettajan opettamaan tytöille Koraania joka lauantai. Tähän sisältyi runsaasti helvetillä pelottelua ynnä muuta mukavaa. Kun Ayaan täytti 16, uusi opettaja sisar Aziza saapui kouluun antamaan islamilaista oppia. Uskonto oli pakollinen aine muslimitytöille ja sen myötä ajatukset vapaudesta painuivat vähitellen taustalle. Sisar Aziza ei silti ollut aivan yhtä vanhoillinen kuin äidin palkkaama kiertävä opettaja, mutta kyllä hänenkin oppinsa varsin fundamentalistista oli. Vähitellen Ayaan kääntyi muslimiksi. Pikkusisko Haweya ei Ayaanin uudesta mustasta kaavusta pitänyt, vaan kutsui sitä teltaksi. Hirsi Alin sisaren myöhempi kohtalo on varsin surullinen, mutta en halua paljastaa liikaa, vaan kehotan lukemaan kirjan. Tekijän kuvaus kouluajoistaan on hyvin mielenkiintoinen ja osoittaa selkeästi, että islamilainen oppi on syvässä ristiriidassa länsimaissa tapahtuneen naisen emansipaation kanssa. Kirjaan sisältyvä Somalian tapahtumien esittely on myös suomalaiselle lukijalle erityisesti mieleen, koska maasta on tullut runsaasti pakolaisia tänne. Infidelin luettuaan ymmärtää, millaisista oloista nämä ihmiset ovat joutuneet pakenemaan. Maa oli vuonna 1990 täyden kaaoksen vallassa ja sattuu olemaan tätä kirjoittaessanikin. Islamilaiseen tapaan Ayaanin isä ilmoitti eräänä perjantai-iltapäivänä vuonna 1992, että oli löytänyt hyvän aviomiehen tyttärelleen. Tytön mielipidettä ei kysytty. Länsimaisista kirjoista omaksuttu naisen vapaus valita ei sittenkään ollut totta islamilaisessa arjessa. Ayaan oli tosin aiemmin mennyt salaa – ”epävirallisesti” – naimisiin serkkunsa kanssa ja menettänyt neitsyytensä varsin ikävällä tavalla. Ei siis ihme, että hän katui ratkaisuaan ja serkkupoikakin katosi pian omille teilleen, Venäjälle. Huvittava yksityiskohta on se, että eräänä aamuna Ayaan sai englanninkielisen kirjeen suomalaisnaiselta, joka oli rakastunut kyseiseen serkkuun Suomessa! Nainen kyseli, oliko Ayaan todella miehen serkku, kuten tämä oli väittänyt naisen nähtyä valokuvan Ayaanista ja miehestä. Nainen halusi mennä serkun kanssa naimisiin. Tekijä kertoo, että tämä kirje oli kuin lahja – hän kun oli jo melkein unohtanut koko miehen! Isän valitsema aviomies ei myöskään ollut Ayaanille mieleen. Miekkonen ei vaikuttanut kovin älykkäältä eikä tuntenut vanhoja somalialaisia tarinoita. Pahinta oli, että mies ei tunnustanut tietämättömyyttään eikä lukeneisuuden puutettaan. Lisäksi hän valitteli, että nykyisessä asuinmaassaan Kanadassa somalinaiset olivat käytännössä huoria, joivat alkoholia, kävivät diskoissa, eivät peittäneet itseään ja makasivat miesten kanssa. Mies halusi siveän muslimitytön lastensa äidiksi. Suurenmoisen Hirsi Maganin tytär oli tähän tarkoitukseen omiaan. Sääli vain, että Ayaanin, hänen sisarensa ja veljensä mielestä mies oli idiootti. Isä oli kuitenkin päätöksensä tehnyt. Tästä huolimatta tytär osoitti jälleen kerran kykynsä toisinajatteluun ja itsenäiseen päätöksentekoon. Nämä ominaisuudet luonnehtivatkin Ayaan Hirsi Alia mainiosti. Hän nimittäin uskaltaa olla eri mieltä ja heittää haasteita. Tässä ei ole mahdollista mennä tekijän paon yksityiskohtiin, mutta lyhyesti sanoen hän livahti uudelta aviomieheltään Frankfurtin, Düsseldorfin ja Bonnin kautta Hollantiin ja sai siellä pakolaisstatuksen. Kuten tunnettua, Hirsi Ali päätyi lopulta aina Hollannin parlamenttiin asti, kiistellyksi kansanedustajaksi. Hirsi Ali joutui Hollannissa myöhemmin vaikeuksiin, koska turvapaikkaa anoessaan antoi vääriä tietoja. Hän korostaa omaelämäkerrassaan toistuvasti, että harhautus oli viranomaisten ja hänen puoluetovereidensa tiedossa jo kauan ennen siitä äkkiä erään TV-dokumentin jälkeen noussutta kohua. Nykyään tekijä asuukin Yhdysvalloissa. Hollantiin asetuttuaan Hirsi Ali nopeasti omaksui länsimaiset tavat ja opiskeli maan kielen. Hän hämmästyi poliittista historiaa luettuaan, miten erilainen tämä uusi maailma oli. Kaikki oli täällä paremmin, vaikka lapsena hänelle oli nimenomaan kerrottu, että uskottomien parissa vallitsi epäjärjestys, rappio ja synti. Tekijän kuvaus opiskelunsa alkuvaiheista Leidenin yliopistossa on suoranaista vapaan hengen ilotulitusta. Sitä on kerrassaan riemukasta lukea. Tästä liberaalin, moniarvoisen länsimaisen demokratian ylistämisestä on kulttuurirelativismi kaukana. Aiemmin kylvetyt epäilyn siemenet johtivat tekijän nopeasti täydelliseen ateismiin ja älylliseen rehellisyyteen islamin räikeiden epäkohtien myöntämisessä. Hirsi Ali joutui kuitenkin uusien näkemystensä vuoksi nopeasti vaikeuksiin. Hänen kärkevät julkiset kannanottonsa maahanmuuttajien tavoista, mm. tyttöjen sukuelinten silpomisesta ja kunniamurhista, eivät miellyttäneet maahan asettuneita vanhakantaisia islamisteja. Hirsi Alin rohkea vapaa-ajattelu ja länsimaissa itsestäänselvyytenä pidetyn sananvapauden käyttäminen aiheuttivat sen, että hänelle piti varsin pian asettaa henkivartijat. Alussa mainitun Submission Part 1 –lyhytelokuvan TV-esityksen ja Theo van Goghin murhan jälkeen käsikirjoittaja-kansanedustaja Hirsi Alin elämä oli yhtä pakoa. Hänet piti viedä aina Yhdysvaltoihin saakka, jotta muslimifundamentalistit eivät pääsisi häneen käsiksi. Tekijä koki olevansa kuin vanki. Yhdysvaltoihin Hirsi Ali siis myöhemmin päätyi asumaan, osittain pakosta, valehdeltuaan turvapaikan haun yhteydessä, mutta viime kädessä kuitenkin omasta halustaan. Juuri Yhdysvalloissa Hirsi Ali on Infidelin kirjoittanut ja julkaissut. Hirsi Alin omaelämäkerta on erittäin tärkeä valistushenkinen teos ja sitä voi lämpimästi suositella varsinkin niille, jotka ovat kiinnostuneita Somalian kulttuurista ja tilanteesta, ihmisoikeuksista, feminismistä, maahanmuutosta, muhamettilaisuudesta ja ylipäätään islamilaisesta arjesta. Erityisesti toivoisin, että Hirsi Alin esiin nostamat lukuisat maahanmuuton epäkohdat otettaisiin meillä Suomessakin avoimeen keskusteluun, jottei täällä ajauduttaisi samanlaiseen ikävään kehitykseen kuin Hollannissa. Poliittinen korrektius ja kulttuurirelativismi eivät saa estää islamin elintärkeää maallistumista. Juuri islamin maallistuminen on sen vaikutuspiiristä tulevan maahanmuuton ja muhamettilaisten korkean syntyvyyden vuoksi ainoa realistinen vaihtoehto kyseisen totalitaristisen uskomusjärjestelmän, joka ei suvaitse mm. homoseksuaalisuutta eikä ateismia, ja vapaamielisen länsimaisen kulttuurin syvien ristiriitojen ratkaisemiseksi. Kyse on ennen kaikkea Euroopan, sen tieteen, taiteen ja moniarvoisen yhteiskuntamallin tulevaisuudesta. Näitä puolustamaan tarvitaan näköjään älykkyydessään, rohkeudessaan ja esimerkillisyydessään vertaansa vailla oleva kaunis somalinainen. Niin muuttuu maailma, Eskoni, mutta missä menee hallitun muutoksen raja? Tuftsin yliopiston filosofian professorin Daniel C. Dennettin vasta suomeksi ilmestynyt Lumous murtuu – Uskonto luonnonilmiönä (suom. Kimmo Pietiläinen; Terra Cognita 2007) on erittäin tärkeä teos monessakin mielessä. Uskonnot ovat toistaiseksi saaneet erivapauden skeptisen asennoitumisen suhteen, pitkälti liiallisen hienotunteisuuden ja saavuttamansa yhteiskunnallisen vallan vuoksi. Uskontoja on myös pidetty ”korkeampina” ilmiöinä kuin silkkaa taikauskoa, vaikka ne sitä itseään ovatkin. Kuitenkin on selvää, että joukkotuhoaseiden aikakaudella primitiiviseen taikauskoon perustuvien näkemysten aiheuttamat konfliktit voivat johtaa silmittömään tuhoon. Dennettin kirja on siis enemmän kuin tervetullut – se on suorastaan välttämätön. Haluan aluksi kiittää kustantaja-suomentaja Kimmo Pietiläistä nopeasta toiminnasta. Dennettin vaativa suomennos saatiin meillä luettavaksi vuoden sisällä alkuperäisteoksen ilmestymisestä. Nopea suomennostyö ei ole pahemmin vaikuttanut tekstin luettavuuteen, joskin eräät termivalinnat hieman häiritsevät. Luonnontieteellisesti suuntautunut Pietiläinen kääntää filosofiassa vakiintuneet termit omalla tavallaan, kuten sanan ’thing’ asiaksi tai esineeksi (vakiintunut suomalainen muoto on ’olio’) ja sanan ’object’ esineeksi (filosofiassa termiä ei kuitenkaan käännetä). Toisinaan teksti vaikuttaakin perin oudolta, kuten luvussa ”Jumala tavoitteellisena esineenä”. Sen sijaan ’Jumala intentionaalisena objektina’ kuulostaa filosofisesti luontevalta. Samoin Pietiläinen kääntää vaihtelevasti Dennettin ja mielen filosofian kenties tärkeimmän käsitteen ’intentionality’, joka esiintyy muodoissa ’tarkoituksellisuus’, ’tavoitteellisuus’ ja vihdoin Liite D:ssä suomeen vakiintuneessa muodossaan ’intentionaalisuus’. Tietysti hankalasti suomeksi taipuvia kirjoja julkaisevalta kääntäjältä on kohtuutonta vaatia joka alan terminologian suvereenia hallintaa, mutta tällaiset peruskäsitteet pitäisi kyllä saada kohdalleen. Kaikki keskeiset suomenkieliset termit löytyvät mm. WSOY:n oivallisesta Filosofian sanakirjasta (1999). Muilta osin Pietiläinen on jälleen tehnyt erinomaista työtä, koska Dennett on nimenomaan luonnontieteellisesti suuntautunut ajattelija. Tämä onkin Dennettin kiistaton vahvuus. Jotenkin surkuhupaisa on Dennettin nautittavan pisteliäästi tarkastelema asiain tila, jonka myötä uskontojen luonnontieteellistä selittämistä vastustetaan myös tiedeyhteisön sisältä. Tekijä onkin joutunut sijoittamaan teoksensa loppuun oman liitteen humanisteille ja sosiaalitieteilijöille, ns. postmodernisteille. Tosin aihetta sivutaan toistuvasti myös varsinaisessa tekstissä. On äärimmäisen outoa, että yliopistolle pesiytynyt ylimielinen relativistiklikki vastustaa henkeen ja vereen minkä tahansa ”korkeamman” ilmiön täsmällistä ja kurinalaista tutkimista. Näin tämä muodikkaaseen ”hermeneuttis-kirjalliseen” traditioon nojaava lahko tahtomattaan tai tahtoen tulee liittoutuneeksi teologien, imaamien ja pappien kanssa, jolloin taikauskoon perustuvat valheet ja myytit pysyvät sitkeästi pystyssä. Niitä itse asiassa jatkuvasti vahvistetaan yliopiston sisältä käsin tapahtuvalla nuorison indoktrinaatiolla ja uusiakin huuhaa-teorioita syntyy kuin sieniä sateella. ”... lisäksi kaikki tietävät paremmin – riippumatta siitä mitä ihmiset sanovat akateemisen taistelun pyörteissä. He paljastavat tämän yhä uudelleen arkielämässään. En ole vielä tavannut postmodernia luonnontieteen kriitikkoa, joka pelkää lentokoneessa matkustamista, koska hän ei luota tuhansien ilmailuinsinöörien ja fyysikoiden laskelmiin, jotka ovat vahvistaneet ja hyödyntäneet lentämisen periaatteita, enkä myöskään ole kuullut hurskaasta wahhabista, joka mieluummin konsultoi suosikki-imaamiaan kuin geologien laskelmia Saudi-Arabian todennetuista öljyvaroista. Jos ostat ja asennat uuden akun matkapuhelimeesi, odotat sen toimivan ja olet melko yllättynyt ja vihainen, jos niin ei käy. Olet täysin valmis panemaan pääsi pantiksi ympärilläsi olevan teknologian hämmästyttävästä luotettavuudesta etkä edes ajattele asiaa sen enempää. Jokainen kirkko luottaa aritmetiikkaan kolehtitulojensa tarkassa seurannassa, ja syömme tyynesti aspiriinista Zoraxiin ulottuvia lääkkeitä luottaen siihen, että niiden turvallisuutta ja tehokkuutta koskevalla hypoteesilla on riittävät luonnontieteelliset todisteet” (s. 355). Tekijä ei tietenkään tyydy pelkkään naljailuun – vaikka sitä olisi kyllä mielellään lukenut enemmänkin – vaan esittelee kirjassa myös luonnontieteellisen metodin ylivoimaisuuden teologis-litterääriin yliopistosaivarteluun verrattuna. Teosta voidaan siis mainiosti käyttää myös tieteenfilosofian opetuksessa. ”Kuka on oikeassa? En tiedä. Eivät tiedä myöskään miljardit ihmiset, joilla on intohimoisia uskonnollisia vakaumuksia. Eivät tiedä ateistitkaan, jotka ovat varmoja että maailma olisi parempi paikka, jos uskonnot kuolisivat sukupuuttoon. On eräänlainen epäsymmetria: ateistit yleisesti suhtautuvat myönteisesti näkemystensä, käytäntöjensä ja syidensä intensiivisimpään ja objektiivisimpaan tutkimukseen. (Itse asiassa heidän lakkaamaton itsetutkistelun vaatimuksensa voi käydä varsin rasittavaksi.) Sen sijaan uskonnolliset usein ärtyvät nenäkkyydestä, kunnioituksen puutteesta, pyhäinhäväistyksestä, johon halu tutkia heidän näkemyksiään viittaa. Olen kunnioittavasti eri mieltä: he todellakin vetoavat tässä muinaiseen perinteeseen, mutta se on virheellinen eikä sen jatkumista tule sallia. Tämä lumous on murrettava ja se on murrettava nyt” (s. 29-30). Dennett pohtii syvällisesti myös sitä, ansaitseeko uskonto vaatimansa korkean moraalisen aseman. Ei ansaitse. ”[j]oskus ’yleisessä tiedossa olevat’ virheet ja myytit voivat elää loputtomiin yksinkertaisesti, koska niiden paljastamisesta on tehty pelottavaa tai hankalaa tai tabu. Perusteeton yhteinen oletus voi elää vuosia tai jopa vuosisatoja, koska jokainen olettaa, että jollakin muulla on hyvät syyt pitää sitä yllä eikä kukaan uskalla haastaa sitä” (s. 31). Tekijä on tässä tismalleen oikeassa, sillä me kaikki tiedämme lukuisia esimerkkejä tällaisista yhteiskunnassamme vaalituista tabuista, joille ei ole minkäänlaisia tosiasiallisia perusteita. Nykyisin tässä suhteessa huolestuttava trendi on tosiaan se, että merkittävä osa näistä uskomuksista on lähtöisin yliopistojen humanistis-sosiaalitieteelliseltä sektorilta. Dennettin kirja onkin oivallinen opas niiden syiden taustoihin, joiden vuoksi luonnontieteellisen metodin voimaa suorastaan pelätään. Kun totuuden armoton valo on kerta toisensa jälkeen paljastanut, ettei keisarilla ole lainkaan vaatteita, on eksaktin metodiikan kammoamiselle kosolti perusteita niissä piireissä, jossa tabujen sekä myyttien vaalimisella saa helpoiten titteleitä, mainetta ja kunniaa, niin maan päällä kuin taivasten valtakunnassa – tai sekä että (joskin ateisti sanoo jälkimmäisestä paikasta haisevan vastalauseensa!). Tietenkin tabujen tonkimisessa on riskinsä, mutta Dennettin mukaan olisi vastuutonta käyttää niitä tietämättömyyden tekosyynä. Uskontojen luonnontieteellistä tutkimusta näet tarvitaan myös tärkeiden poliittisten päätösten tekemisessä. Syy uskonnollisuuden luonnontieteellisen tutkimisen vastustamiseen on tietenkin se, että biologia on siinä väistämättä avainasemassa. Jostain syystä nimenomaan biologiset selitysmallit ovat humanistis-sosiaalitieteellisesti suuntautuneelle väelle kauhistus. Ehkä Caliban ei vain kestä oman kuvansa näkemistä. Dennett on kuitenkin aidosti liikkeellä monitieteisellä ohjelmalla, jolloin humanisteille ja sosiaalitieteilijöillekin riittää työsarkaa uskontojen kaivelemisessa. Oppialojen väliselle kateudelle ja ”luonnontieteellisen imperialismin” pelolle ei siis projektissa tule antaa jalansijaa. Dennett nimittää näitä ilmiöitä osuvasti ”ideologiseksi rautaesiripuksi”. Tekijä käyttää tässä yhteydessä apuna hypoteettista marsilaista tutkijaa, joka tarkastelee ihmisen uskonnollista toimintaa ikään kuin täysin ulkopuolisena, riittävän etäisyyden päästä. Näin eri teoriat myös saadaan parhaiten erotelluksi toisistaan. Tärkeintä evolutiivisessa tarkastelussa on kysymys ”cui bono?”: kuka hyötyy? Dennett on innokas meemiteorian kannattaja ja meemeillä onkin keskeinen rooli teoksessa. Meemihän on biologi Richard Dawkinsin vuonna 1976 teoksessaan The Selfish Gene (Geenin itsekkyys, 2. laitos, suom. K. Pietiläinen; Art House 1993) lanseeraama kulttuurinen vastine geenille – itsekäs kopioituja. Siten uskonnon ei välttämättä tarvitse edistää yksilön tai ryhmän biologista kelpoisuutta, kunhan se edistää uskontomeemin leviämistä. Suotta ei Dawkins ole kutsunut uskontomeemiä ”mielen virukseksi”, niin tehokas ja tuhoisa se on herkkäuskoisen kantajansa mielessä. Dennett kritisoi tässä yhteydessä myös biologi David Sloan Wilsonin ryhmävalintateorioita, jotka ovatkin nykybiologian marginaalissa. Erittäin hieno lisä teokseen on liite A, jossa Dennett kumoaa monia meemiteoriasta esitettyjä vastalauseita ja esittelee alan keskeiset opit ytimekkäästi sekä selkeästi. Kirjailija ei tietenkään kiellä uskontojen hyviä puolia, vaan päinvastoin korostaa katedraalien, moskeijoiden ja sävellysten kauneutta, joista saamme uskontoa kiitää. Samoin joillekin yksilöille uskonto suo elämän tarkoituksen ja kenties jopa pelastuksen – virus ei siis välttämättä ole aivan niin viheliäinen kuin armoton Dawkins väittää. Kuitenkin on selvää, että vaikka uskonnosta olisi kuinka paljon iloa ja hyötyä, se ei ratkaise niiden sanoman totuutta. Selvää on, että uskonnot ovat myös haitaksi – niin yksilöllisellä kuin yhteiskunnallis-valtiollisella tasolla. Dennettin teos onkin äärimmäisen hieno tutkimusohjelman luonnos ja toivoa sopii, että hänen ehdotukseensa suhtaudutaan vakavasti ja koko tiedeyhteisö ryhtyy uskontoja innolla dekonstruoimaan. Ideologisen rautaesiripun on näet murruttava siinä missä pilvilinnojen lumouksenkin. Amerikkalainen ateisti-taikuri Penn Jillette sanoi hiljattain eräässä radiohaastattelussa, että jos ateismilla olisi paavi, se olisi eittämättä Richard Dawkins. Jos näin on, on Dawkinsin uusi kirja The God Delusion (Bantam Press 2006) ateistin Raamattu. Kirjailija tuskin tästä vertauksesta ilahtuisi, sen verran raskaalla kädellä hän Raamattua teoksessaan suomii. Vanhan Testamentin jumala on Dawkinsin mielestä kaunokirjallisuuden vastenmielisin hahmo. ”Kateellinen ja ylpeä siitä; pikkumainen, epäoikeudenmukainen, anteeksiantamaton kontrollifriikki; kostonhimoinen, verenhimoinen etninen puhdistaja; naisia vihaava, homofobinen, rasistinen, lapsi-, kansan- ja veljesmurhanhimoinen, ruttoa levittävä, suuruudenhullu, sadomasokistinen, oikukkaalla tavalla pahantahtoinen koulukiusaaja” – näin tylysti Dawkins luonnehtii Vanhan Testamentin Jumalaa. Eräät kirjoittajat ovat juuri tällaisten esimerkkien tiimoilta esittäneet, että kuuluisan evoluutiobiologin hyökkäävyydestä olisi ateismille pikemminkin haittaa kuin hyötyä. Kirjailija itse ei teesiä kuitenkaan niele. Uskonto on liian pitkään saanut nauttia ansaitsematonta kunnioitusta ja erivapauksia kriittisyyden suhteen, joten nyt on aika ylpeästi ja voitonvarmasti julistaa ateismin puolesta. Toisin sanoen, nyt puhutaan asioista niiden oikeilla nimillä. Syy Dawkinsin kirjaan on ilmeinen: Yhdysvalloissa tilanne on huolestuttava. ID-kreationismi ja uskonnollinen fundamentalismi ovat saaneet jalansijaa, mm. Bushin hallinnon ansiosta. Tässä pätee vanha viisaus: hyökkäys on paras puolustus. Demokraatit voittivat jo kongressivaalit, mutta voittaako järki taikauskon? Paljon on peistä taitettu siitä, kuuluuko kysymys jumalan olemassaolosta tieteen alueelle. Edesmennyt paleontologi Stephen Jay Gould esimerkiksi oli sitä mieltä, että uskonto ja tiede eivät ole ristiriidassa vaan kuuluvat yksinkertaisesti eri kategorioihin (NOMA eli non-overlapping magisteria). Dawkins ei väitettä allekirjoita. Hän tekee jyrkän eron ns. einsteinilaisen ja taikauskoisen jumalakäsityksen välille. Einsteinin on usein sanottu olleen uskovainen, koska hän esitti panteistissävyisiä lausuntoja tyyliin ”jumala ei heitä noppaa”. Tosiasiassa kuuluisa fyysikko ei jumaliin uskonut ja tämän hän mainitsi kirjoituksissaan ja haastatteluissaan monta kertaa. Einstein oli ei-uskonnollisesti uskonnollinen, kuten niin moni muu maailmankaikkeuden rakennetta ja lakeja syväluodannut tutkija (mm. Stephen Hawking), mutta teisti hän ei ollut. Ehkä termi ’spiritualisti’ kuvaa mainitun kaltaisia ihmisiä paremmin. Dawkins määrittelee uskonnon siten, että uskovainen teisti olettaa jonkinlaisen yliluonnollisen olennon, joka on maailmankaikkeuden ja kaiken siellä olevan taustalla, sen luoja, ja joka yhä vaikuttaa tapahtumien kulkuun (s. 18). Tämä olento myös kuulee rukouksia ja vastaa niihin. Deisti taas uskoo, että jumala loi maailmankaikkeuden ja sen lait, mutta sen jälkeen vetäytyi kulisseihin ja antaa tapahtumien edetä omalla painollaan. Turha rukoilla! Myöhemmin (s. 50-51) Dawkins osoittaa agnostisismin kestämättömyyden ja esittää seitsemän kohdan spektrin, jolle teismi contra ateismi todennäköisyyksineen asettuvat. Keskellä, kohdassa neljä, on tietenkin täydellinen 50-50 –agnostisismi. Nämä erottelut lienevät vapaa-ajattelijoille tuiki tuttuja, mutta The God Delusionin oletetulle kohderyhmälle, amerikkalaisille, asiat pitää vääntää rautalangasta. Tekijä on järkähtämätön teesissään, että jumala on tieteellinen hypoteesi. Jos tällainen ”yliluonnollinen agentti” olisi olemassa, olisi maailmankaikkeus erilainen kuin se nyt on. Vaikka hypoteesia onkin nykytietämyksen vallitessa mahdoton testata, on se Dawkinsin mielestä selkeästi tieteen alaan kuuluva kysymys. Tähän on helppo yhtyä. Miten sellaista kannattaa ylipäätään olettaa, josta edes periaatteessa ei voi saada tietoa? Dawkinsin keskeinen argumentti jumalaa vastaan on tuttu jo skottifilosofi David Humelta. Jos monimutkaisten eliöiden ja maailmankaikkeuden suunnitteluun tarvitaan monimutkaista älykästä olentoa, niin kuinka monimutkaisen ja älykkään tällaisen olennon sitten tarvitseekaan olla! Ja koska Darwinin evoluutioteoria selittää monimutkaisten eliöiden synnyn ja kehityksen ilman oletusta suunnittelijasta, kuten fysiikka selittää maailmankaikkeuden, on jumalan olemassaolo äärimmäisen epätodennäköistä. Kirjailijan mukaan yleinen luulo, että Yhdysvaltain perustajaisät olivat teistejä, ei pidä paikkaansa. Moni heistä oli mitä luultavimmin ateisti. Dawkins esittää lainauksia mm. Thomas Jeffersonilta, jotka osoittavat, ettei tämä ollut ainakaan teisti. Nykyään Yhdysvaltain uskonnollinen oikeisto vaalii myyttiä, jonka mukaan valtio perustettiin kristilliselle pohjalle. Dawkins viittaa tässä yhteydessä Tripolin sopimukseen, joka luonnosteltiin George Washingtonin johdolla vuonna 1796 ja jonka John Adams allekirjoitti vuonna 1797. Sopimuksen avauslauseessa sanotaan suoraan, että Yhdysvaltain hallinto ei missään mielessä perustu kristinuskoon eikä se halua vihamielisyyksiä muslimien kanssa. Kirjoittaja toteaa tähän liittyen, että ”tämän päivän Amerikassa on valloillaan uskonnollisen fanaattisuuden henki ja perustajaisät olisivat olleet kauhuissaan” (s. 41). Toisaalta hän pohtii sitä, onko Yhdysvaltain perustuslakiin kirjattu valtion ja kirkon erillisyys syy maassa rehottavaan fundamentalismiin, koska Euroopassa meno on maallistuneempaa. Harvoin Dawkins on kirjoituksissaan ollut poliittisesti niin epäkorrekti kuin osiossa, jossa hän kartoittaa tiedeyhteisöä löytääkseen uskovaisia. Tieteen huippunimet ovat näet pääsääntöisesti ateisteja, mm. suurin osa nobelisteista. Kirjailija ei tässä suhteessa salaile elitismiään. Hän menee lopulta niin pitkälle, että mainitsee erään Mensa Magazinessa julkaistun tutkimuksen, jonka mukaan mitä korkeampi älykkyysosamäärä ihmisellä on, sitä epätodennäköisempää on, että hänellä on uskonnollisia tai muunlaisiakaan maagisia uskomuksia. Dawkins ei silti vie ajatusta loppuun saakka. ÄO muodostaa populaatiossa normaalijakauman, joten vain ani harva missään yhteiskunnassa yltää nobelistien ja huippututkijoiden lukuihin. Eikö tästä seuraa suoraan, että vähemmän älykkäiden on turha odottaa ryhtyvän ateistiksi, jos ateismin edellytyksenä on korkea ÄO? Kirjailija ei tosiaankaan huomaa tähän sisältyvää utopismiaan. Tai kenties Dawkins tällä vedolla yrittää vain vedota lukijan älyyn, kykyyn ajatella omakohtaisesti. Hän tietenkin uskoo koulutuksen ja kasvatuksen voimaan. On kuitenkin syytä huomioida, että varsinaisen uskonnollisuuden ohella huippuälykäs ihminen voi hurahtaa myös korvikeuskontoihin, kuten marxismiin, nationalismiin, postmodernismiin, sovinismiin tai feminismiin. Käytännössä nämä ajatuskontrollijärjestelmät johtavat äärimmilleen vietynä skeptisyyden, kriittisyyden ja johdonmukaisuuden mustaan aukkoon siinä missä aidot uskonnotkin. Tällä ei ole mitä ilmeisimmin mitään tekemistä yksilön älykkyyden kanssa; kyse on pikemminkin juuri koulutuksesta ja kasvatuksesta sekä ryhmä- ja moraali-identiteetistä – ja varsinkin oman kilven kiillotuksesta. Aiemmin mainittu Hume on vakuuttavasti argumentoinut, että järki on tunteiden orja. Tämä pätee erityisesti moraalitunteisiin – ihminen on läpeensä sosiaalinen laji. Tekopyhyys kuuluu ihmisluontoon. Rationaalisuus on nykymaailmassa ideologioiden ja uskontojen ylitarjonnan vuoksi valitettavan ahtaalla, joten oli Dawkinsin ÄO-provokaation laita miten tahansa, pieni elitismi ei kriittisen ajattelun lisäämisessä ole pahasta. Toisaalta elitismikin liittyy ihmislajin sosiaalisuuteen, joten olemme tässä ns. puun ja kuoren välissä. On vaikeaa olla eettinen ihminen tekemättä siitä liian suurta numeroa. Ihmiselle on kehittynyt evoluution kuluessa useita psykologisia mekanismeja, jotka mahdollistavat laajamittaisen sosiaalisen vaihdon. Näiden mekanismien avulla ihminen säätelee sosiaalista käyttäytymistään. Vaikka vastavuoroisuuden, sosiaalisuuden ja yhteistyön antama hyöty koituukin viime kädessä yksilön kantamien geenien eduksi, käyttäytyy yksilö silti myös epäitsekkäästi yhteisönsä jäseniä kohtaan. Ja koska organismit elävät proksimaattisella eli välittömällä tasolla, tunteidensa maailmassa, on evoluutio palkinnut kokonaiskelpoisuutta lisäävän käyttäytymisen positiivisin tuntein. Näin selittyy auttamisesta koituva mielihyvä. Kaupan päälle tulee vielä hyvä maine. Kun ihminen pelastaa ventovieraan tai eläimen, lahjoittaa verta tai antaa rahaa Afrikan lapsille, toimivat hänessä pleistoseenikauden metsästäjä-keräilijäyhteisöissä kehittyneet psykologiset mekanismit. Vaikka geenit ovatkin itsekkäitä, niin yksilöt eivät sellaisia välttämättä ole. Uskontoa ei moraalisuus tuekseen tarvitse. Sille täytyy keksiä jokin muu evolutiivinen selitys. Dawkins esittää kirjassa omansa, joka tietenkin liittyy meemeihin, mutta siihen ei tämän arvion puitteissa ole mahdollista mennä. Tekijä puhuu moraalisesta ajanhengestä, joka osoittaa, että pyhiin kirjoituksiin nojaaminen ei todellakaan ole ihmisen moraalikäyttäytymisen syy tai edellytys. Muutama vuosikymmen sitten homoseksuaalisuus oli vielä rikos ja rasismi tavallista; nyt homoseksuaalien ja etnisten vähemmistöjen syrjiminen on yleisen mielipiteen tasollakin tuomittavaa. Itse asiassa ainoat tahot, jotka homoseksuaalisuuteen karsaasti suhtautuvat, löytyvät uskovaisten joukosta. Joillekin heistä jopa naispappeus on syntiä! Entä naturalistinen virhepäätelmä ja Humen giljotiini? Voidaanko tosiasioista johtaa arvoja? Vastaus löytyy evolutiivisesti kehittyneistä moraalitunteista. Siitä miten asiat ovat, ei tietenkään voida suoraan päätellä miten niiden pitäisi olla, mutta siitä miltä ne tuntuvat, voidaan jo melko pitkälle päätellä, ovatko ne oikein vai väärin. Tekijä haluaa kasvatuksen suhteen nostattaa ihmisten tietoisuuteen erään aiemmin laiminlyödyn epäkohdan. Mitä pitäisi sanoa sellaisesta käytännöstä, jossa lapsi kasvatetaan keynesiläiseksi, monetaristiksi, marxistiksi tai natsiksi? Ja kuitenkin on täysin hyväksyttyä, että itsenäiseen ajatteluun kykenemättömät piltit indoktrinoidaan vanhempiensa uskoon. Dawkins rinnastaa uskonnollisten näkemysten väkisin tuputtamisen henkiseen pahoinpitelyyn. Hänen mielestään ihmisten pitäisi protestoida, kun he kuulevat jonkun sanovan esimerkiksi ”meidän Liisa on kristitty lapsi”. Tämä on osa kirjailijan kampanjaa tietoisuuden herättämiseksi. Samoin tekivät feministit ja seksuaalista tasa-arvoa ajavat 1970- ja -80-luvulla. Shokkivaikutus toimii joskus tehokkaasti ja näin ihmiset voivat huomata ajatteluunsa sisältyvät kielelliset lukkiutumat. On mielenkiintoista katsoa, tapahtuuko lasten aivopesun suhteen mitään lähitulevaisuudessa. Syytä olisi. Kirjan loppuhuipennus on Dawkinsille tyypillistä tieteellisen maailmankuvan ylistystä. Hän esittelee lukijoille vertauskuvan ihmisen arkitodellisuudesta, ”Keski-Maasta”, evolutiivisesti kehittyneiden aivojen suodattamana. Tämä meille luonnollinen maailma on tekijän mukaan ”kaikkien burqien äiti”, jolla hän viittaa islaminuskoisten naisten käyttämään kaapuun, joka jättää vain silmien kohdalle pienen kaistaleen, josta voi katsella todellisuutta. Tiede auttaa ihmistä riisumaan oman burqansa ja vie meidät kvanttien sekä ultraviolettivalon ihmeelliseen maailmaan. Tiede vapauttaa! ”Enemmän kätkevät taivas ja maa, Horatio, kuin sun tieteesi uneksiikaan”, totesi Hamlet (suom. Veijo Meri). J.B.S. Haldane puolestaan on lausahtanut, että ”maailmankaikkeus ei ole vain oudompi kuin kuvittelemme – se on oudompi kuin voimme kuvitellakaan”. Tiede on nimenomaan keino, jolla ihmiskunta tätä outoutta ja taivaan sekä maan salaisuuksia kykenee selittämään. Dawkinsin kirja on erittäin tervetullut lisä uskontokriittiseen kirjallisuuteen ja sitä on helppo suositella kaikille. Tällaista loogis-rationaalista ilotulitusta on kerrassaan ilo lukea. Kirja pitäisi mitä pikimmin saada myös suomeksi (arvion jälkeen se on ilmestynyt suomeksi nimellä Jumalharha; suom. Kimmo Pietiläinen; Terra Cognita 2007). Tarvitseeko maailma älymystöä vai totalitarismia?